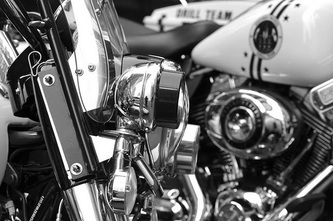 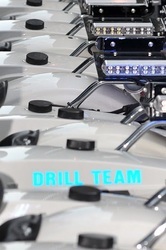 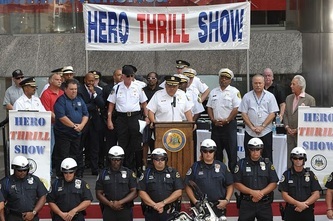 Hero Thrill Show - 2010 from Branded Productions on Vimeo. 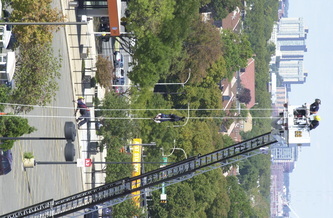 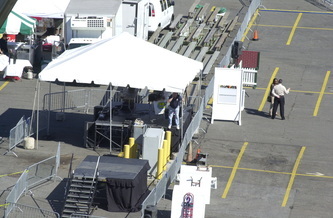 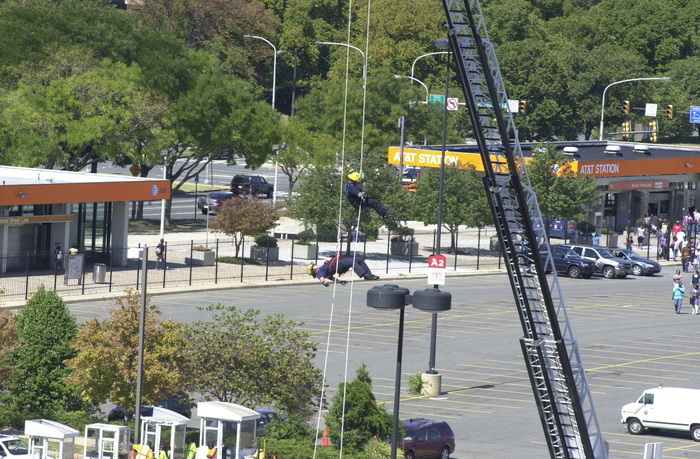 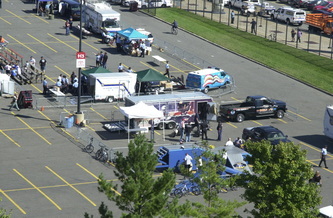 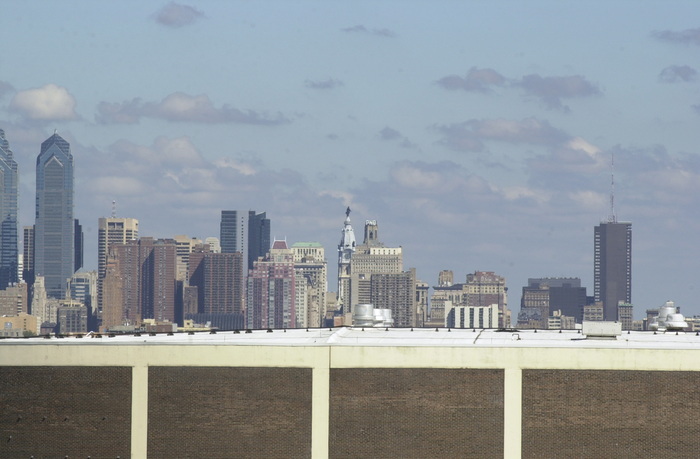 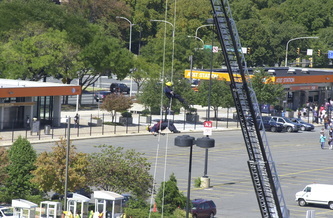 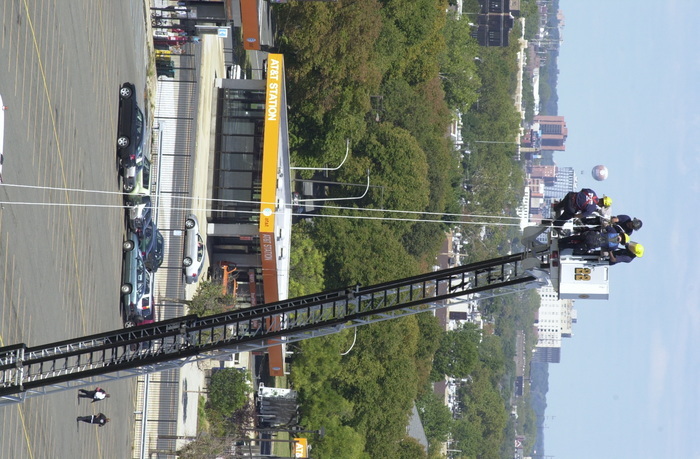 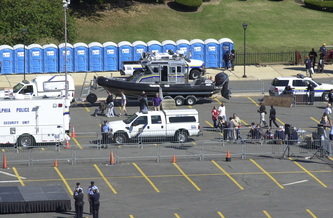 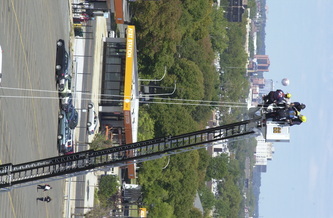 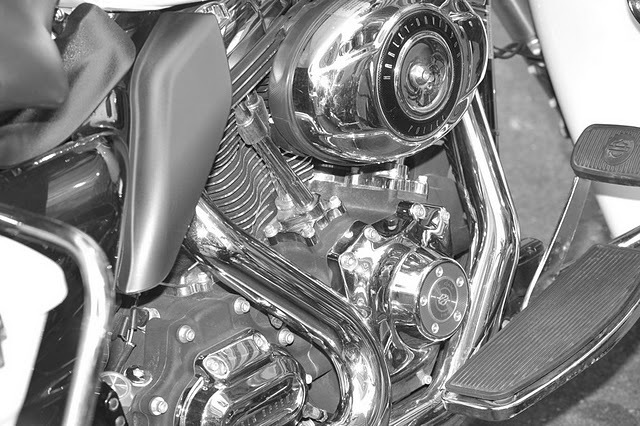 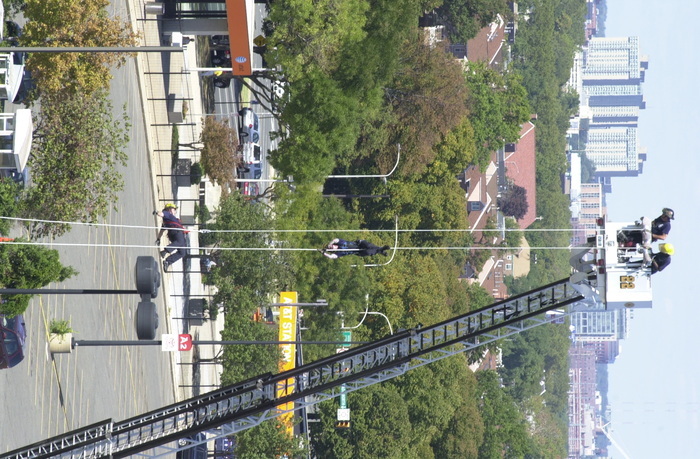 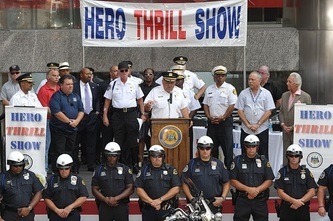 Daredevil stunts, crime fighting tools for public consumption signal another Hero Thrill Show in the making. 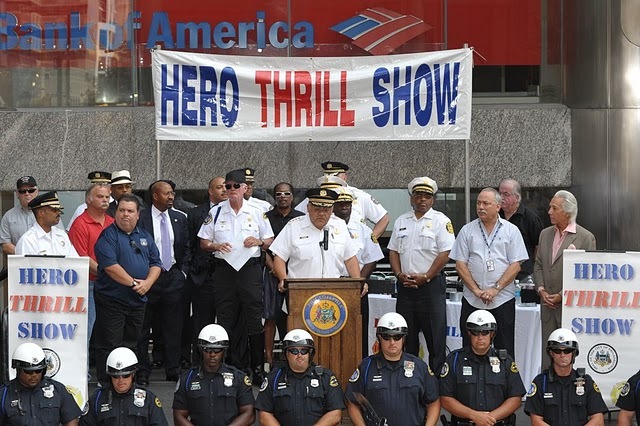 The show is all about increasing funds for college scholarships for children of Philadelphia police officers and firefighters lost in the line of duty. 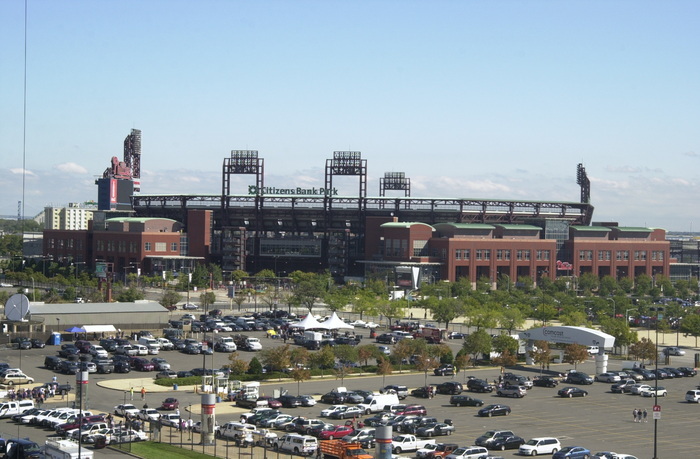 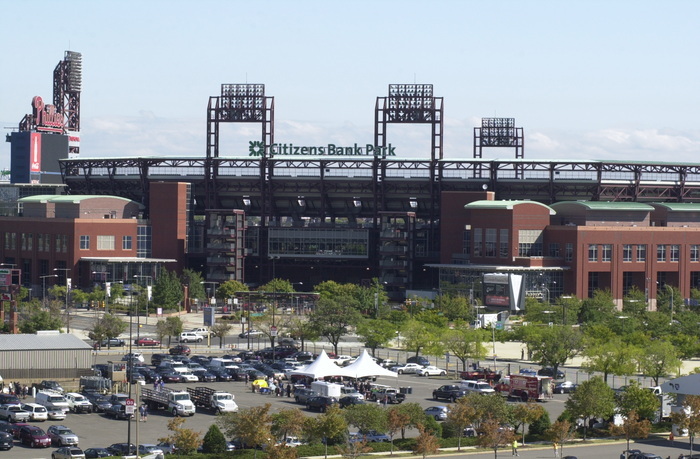 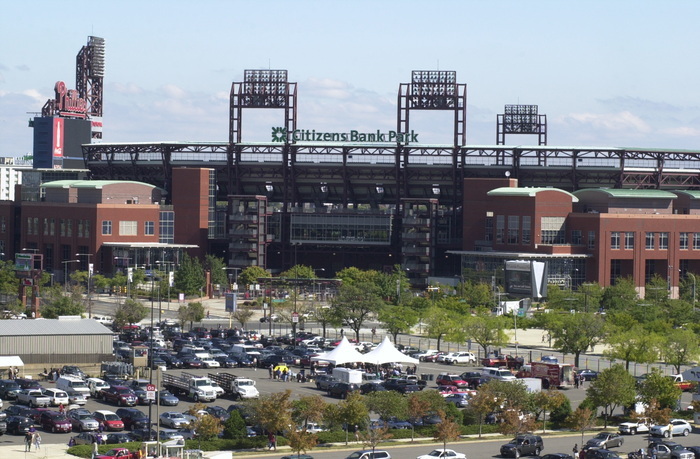 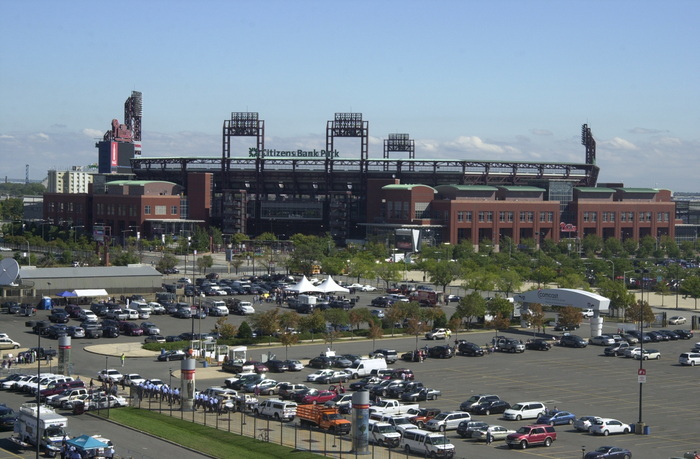 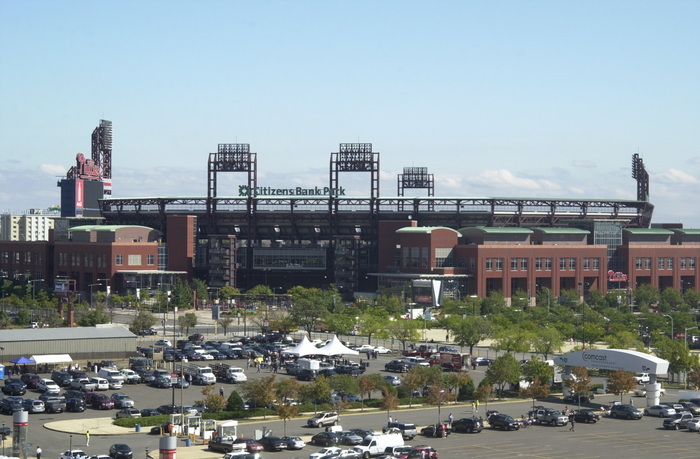 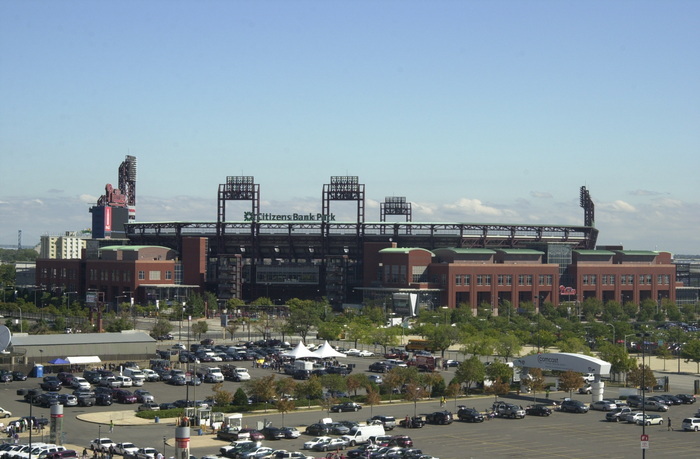 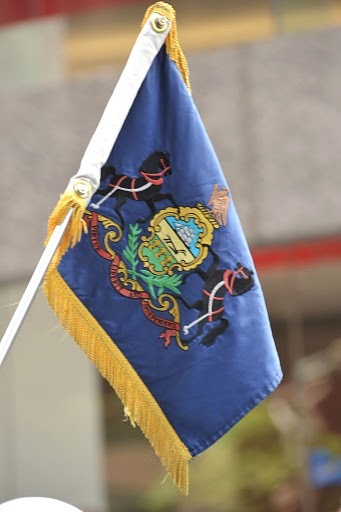 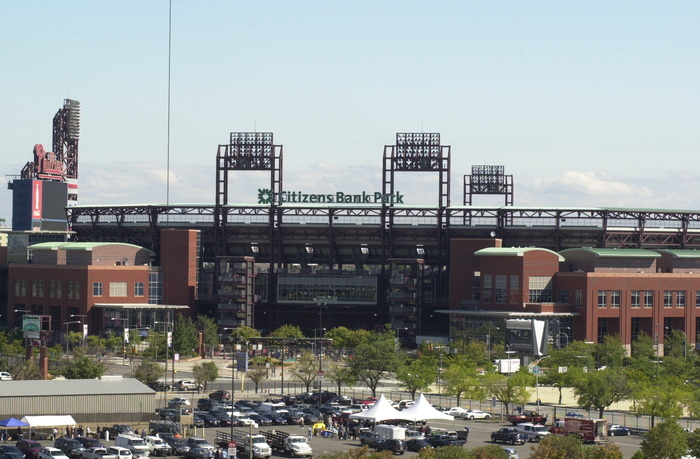 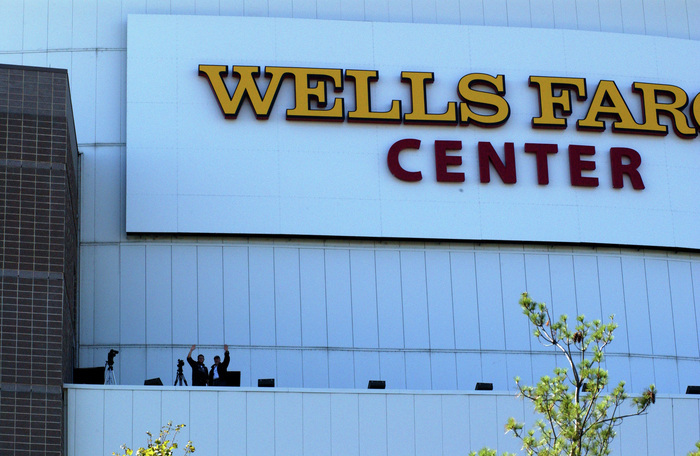 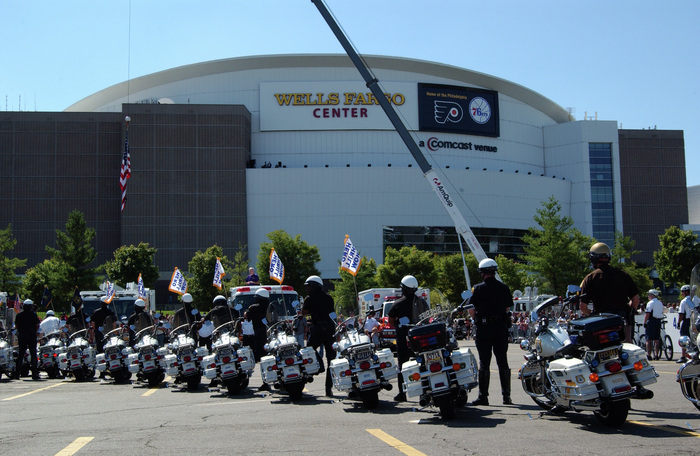 The amount of funds raised depends on the public attending this exciting outdoor event on Saturday, September 18 at the Wells Fargo Center (formerly the Wachovia Spectrum Complex). 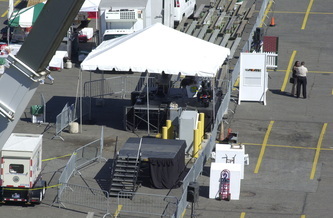 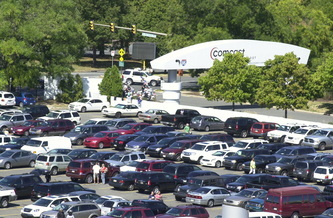 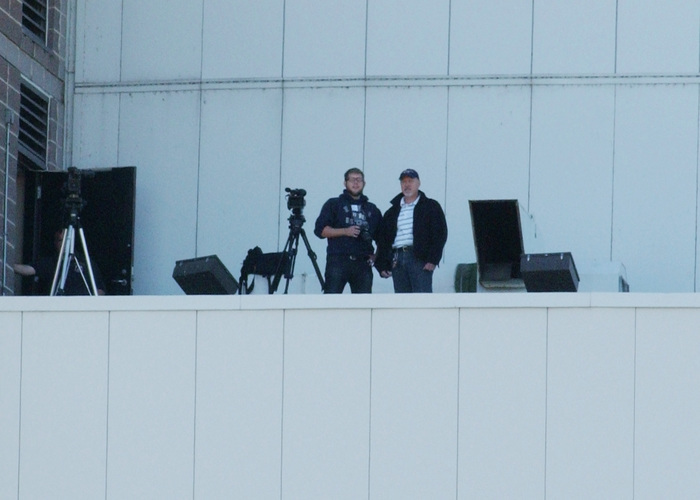 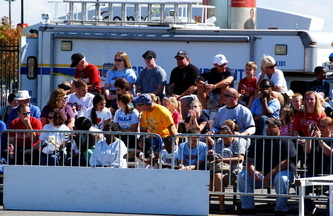 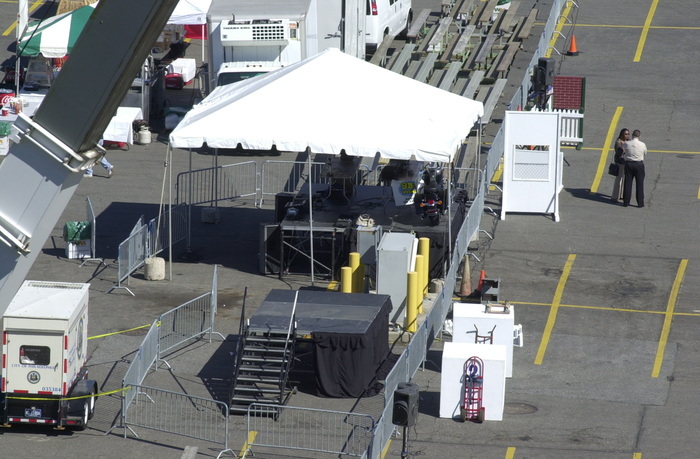 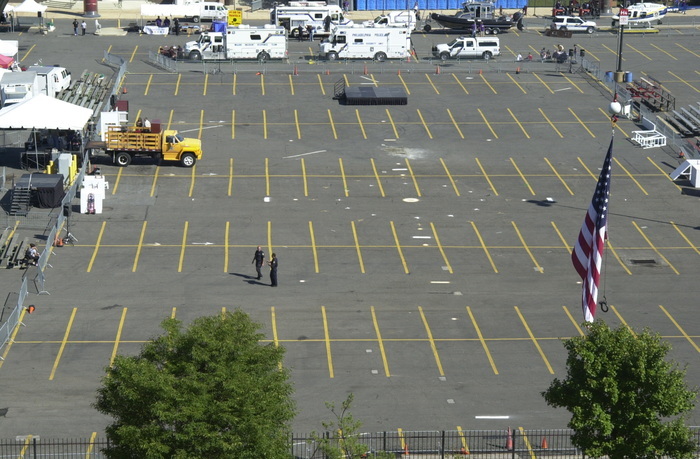 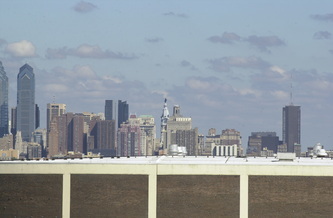 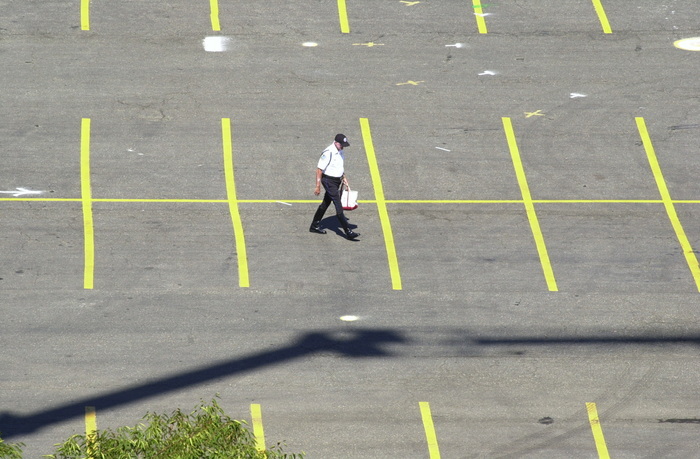 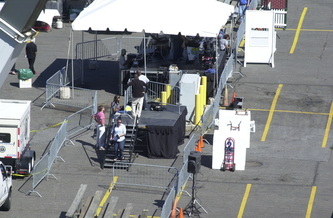 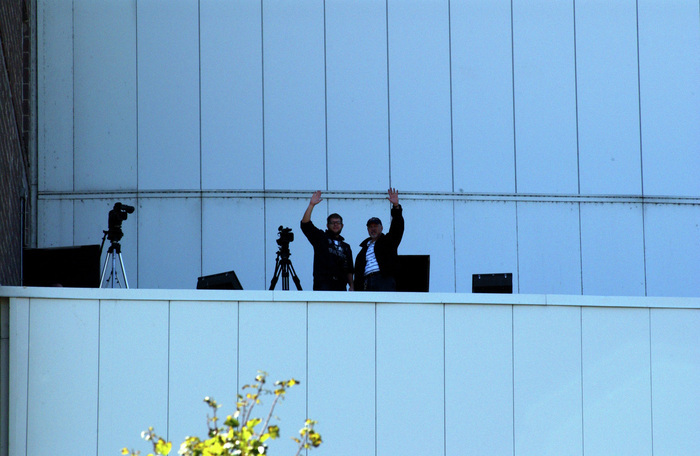 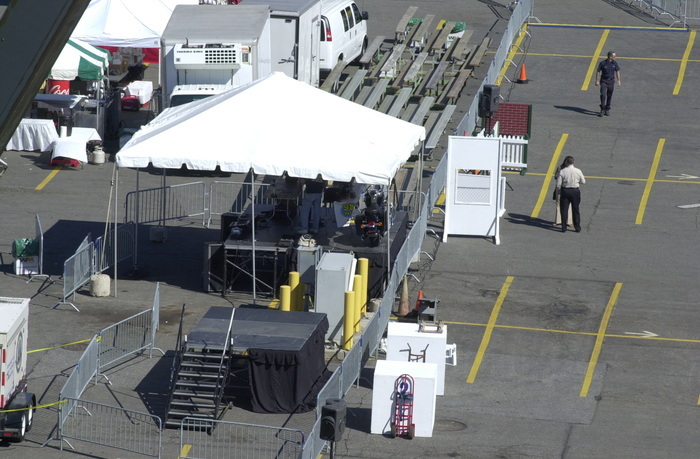 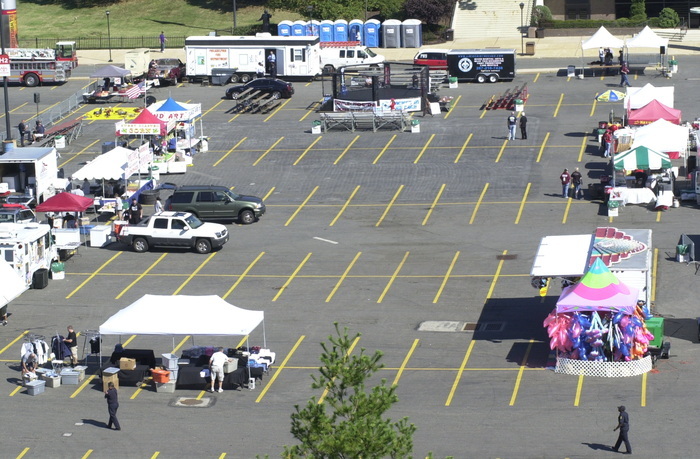 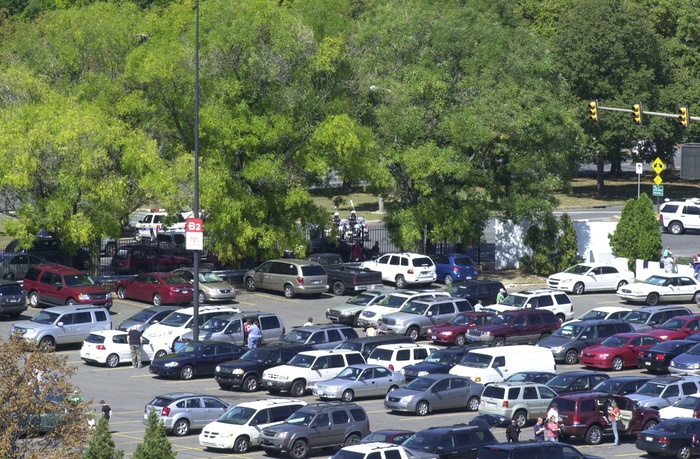 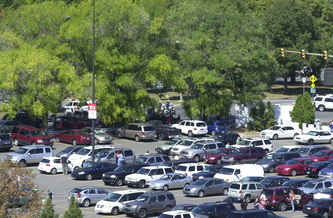 Roughly 40,000 people attended the 2009 show. 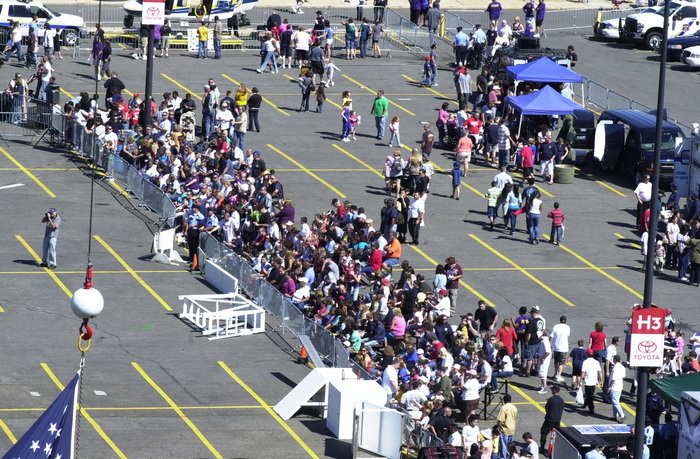 Event planners hope the number will reach to 60,000 this year. 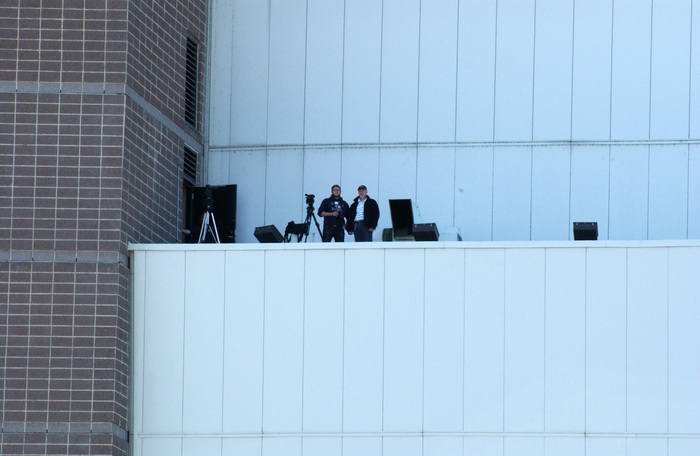 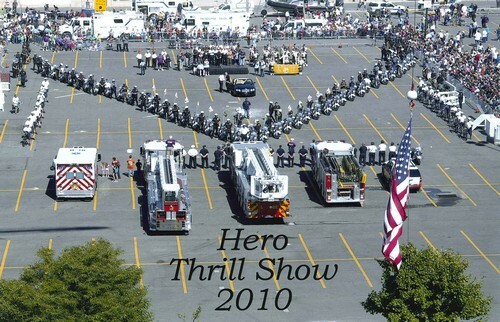 "It was like a phoenix rising from the ashes," Jimmy Binns says about the thrill show. "It was out of business." 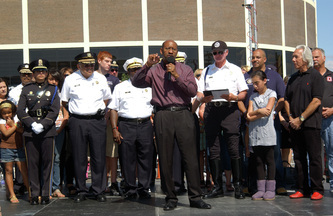 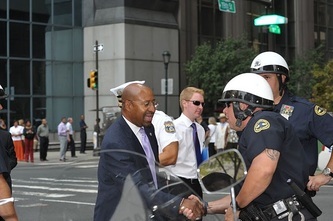 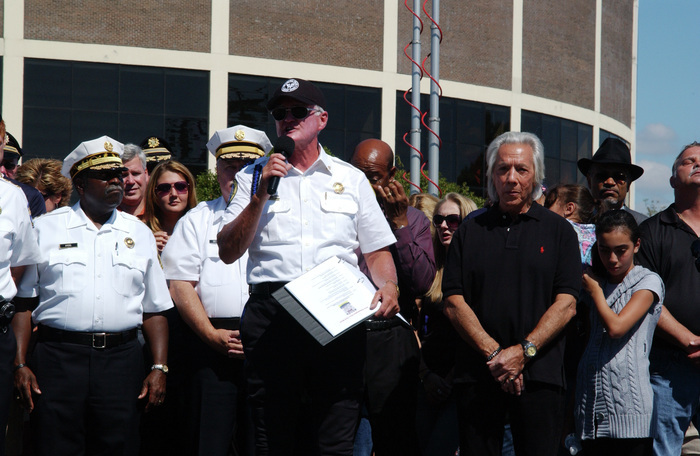 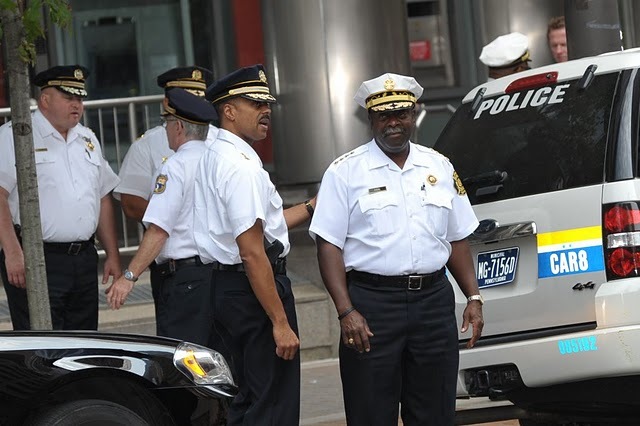 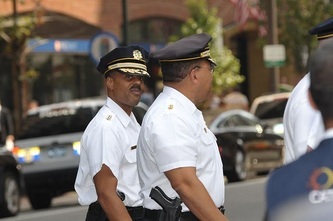 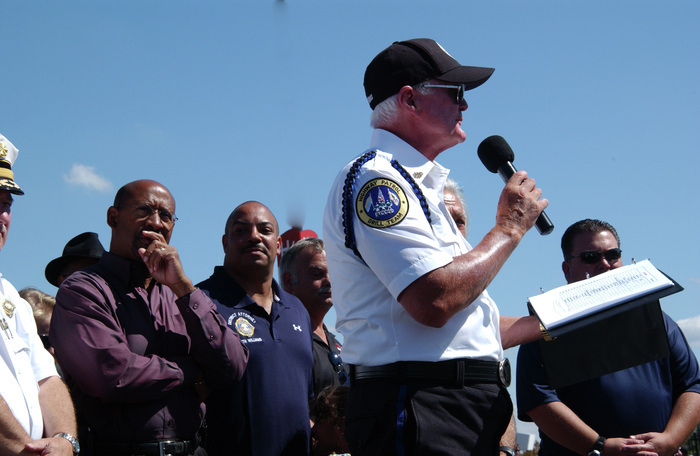 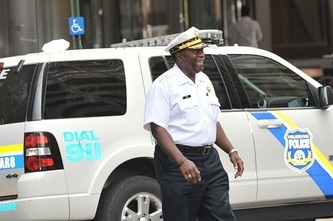 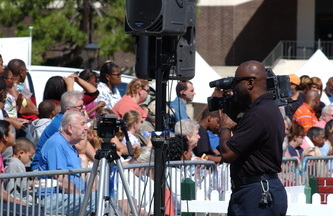 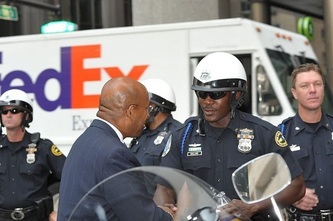 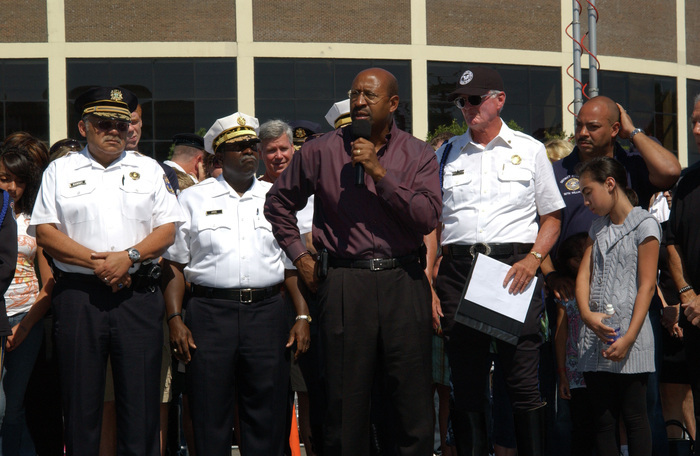 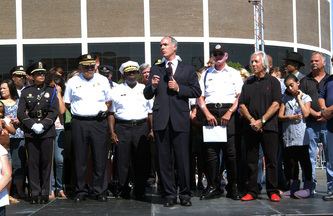 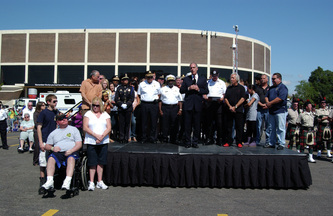 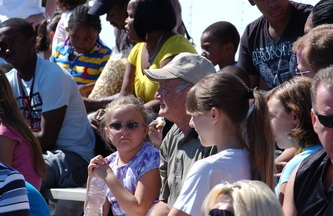 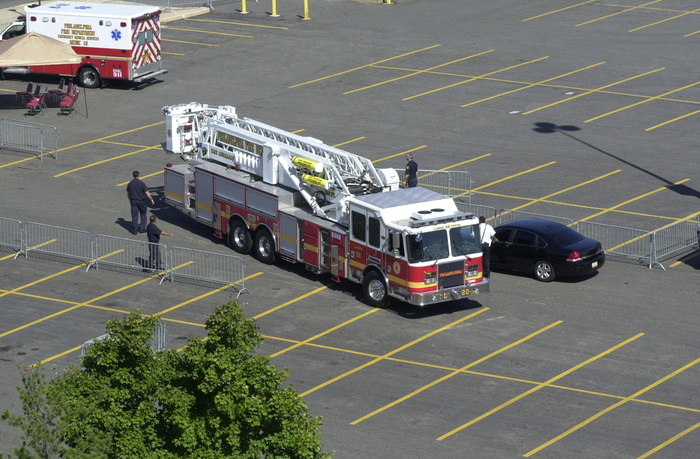 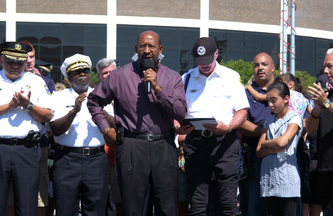 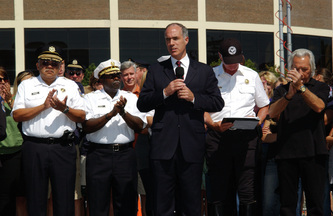 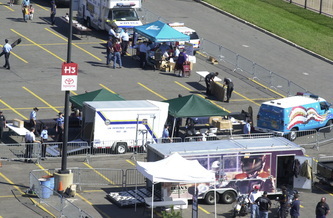 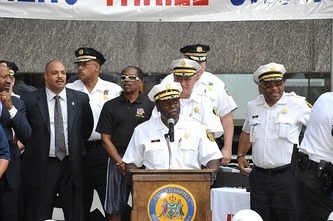 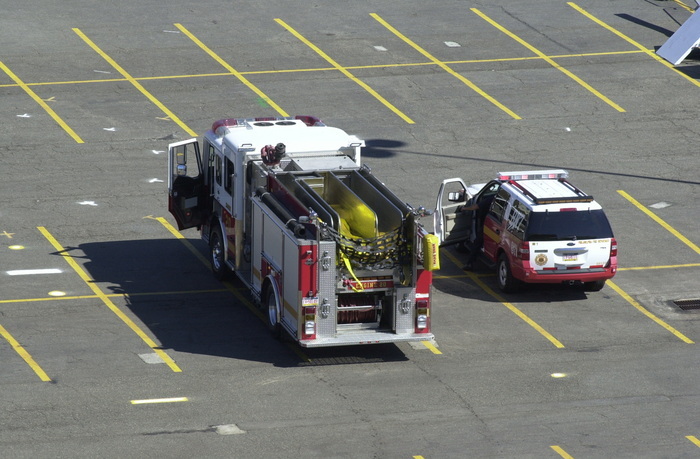 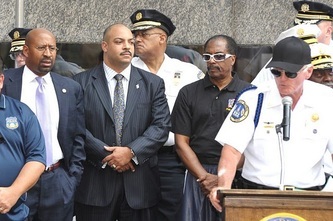 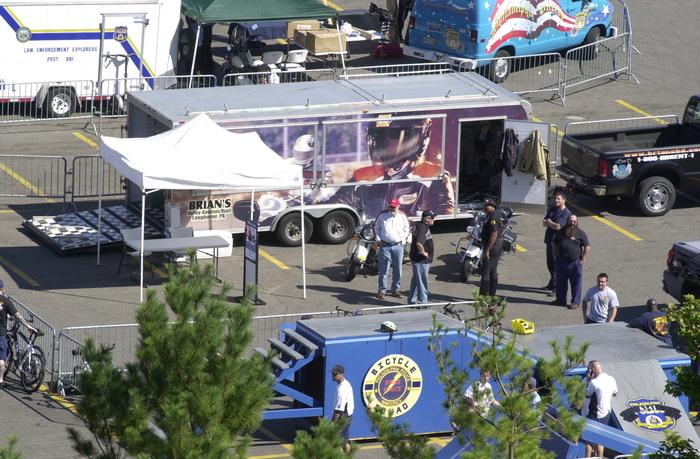 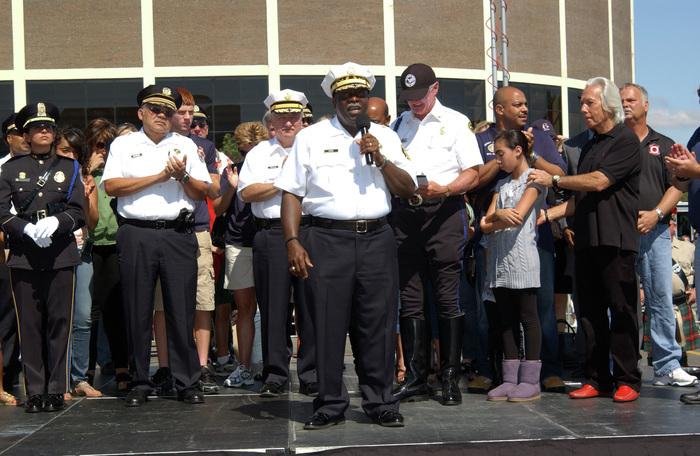 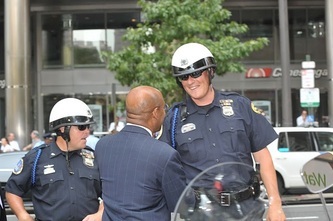 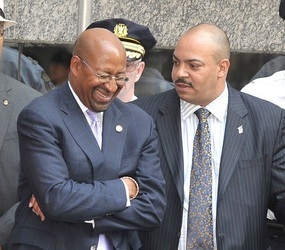 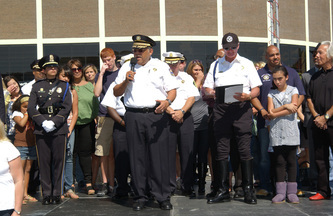 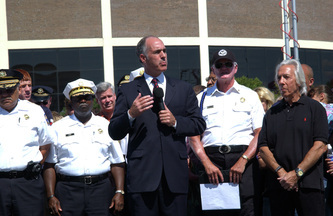 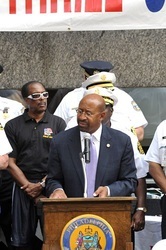 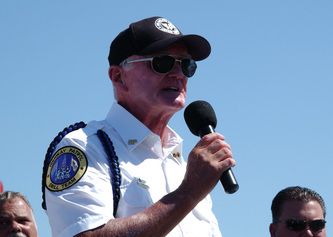 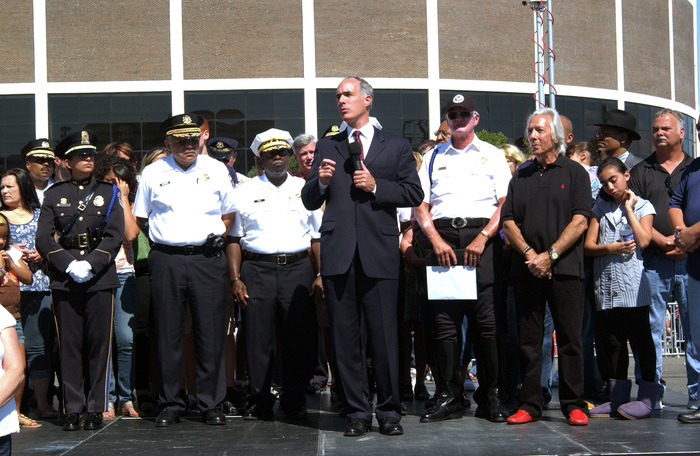 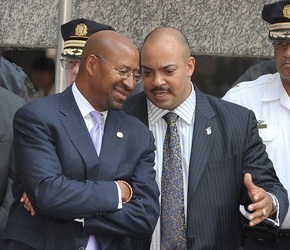 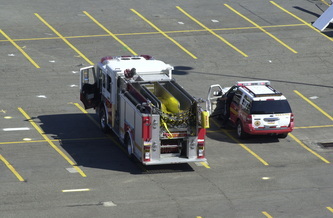 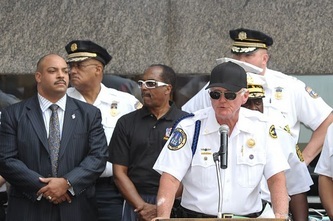 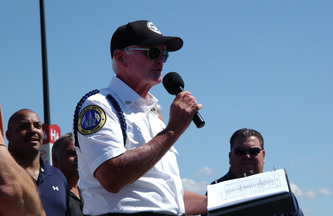 Former police commissioner Sylvester Johnson and current fire commissioner Lloyd Ayers asked Binns to resuscitate the event in 2006. 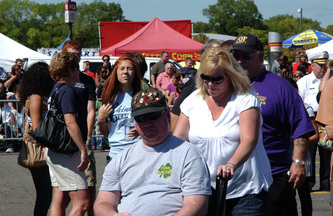 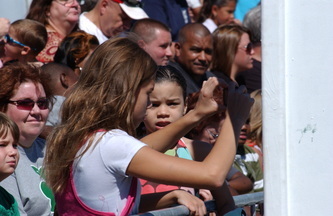 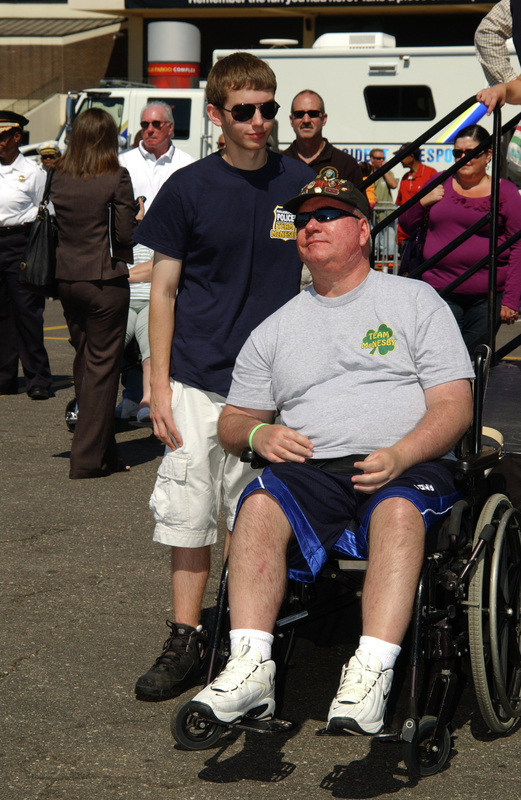 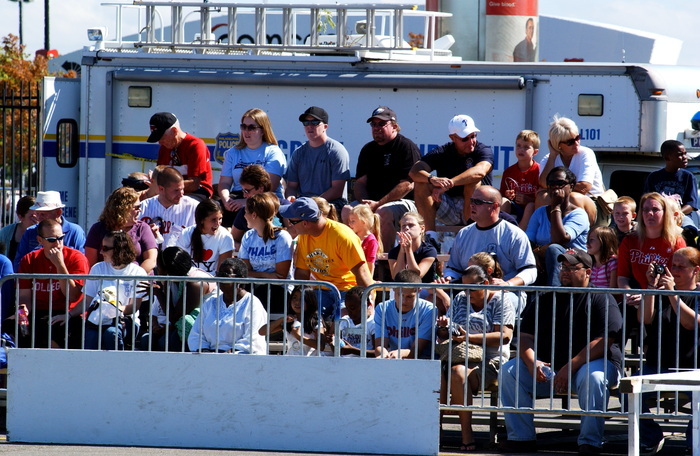 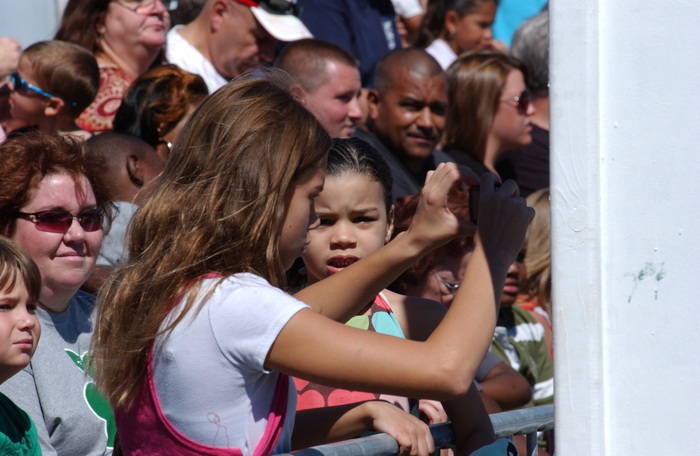 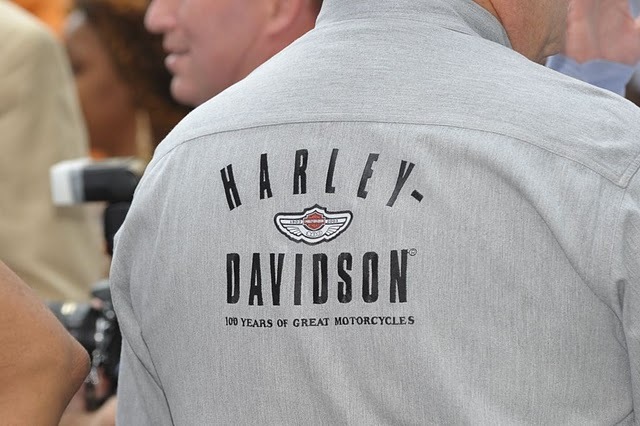 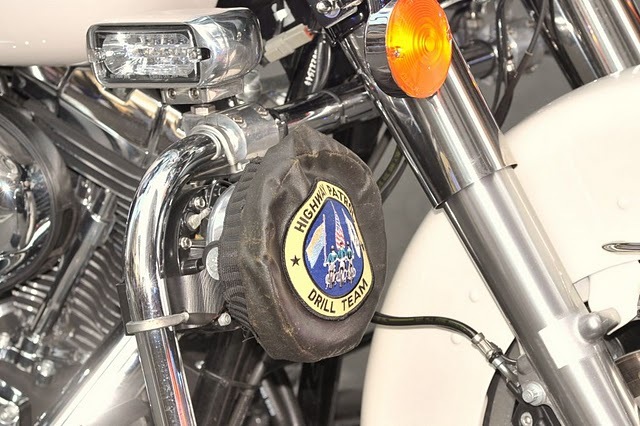 Since then, the Hero Thrill Show raised $1.4 million. 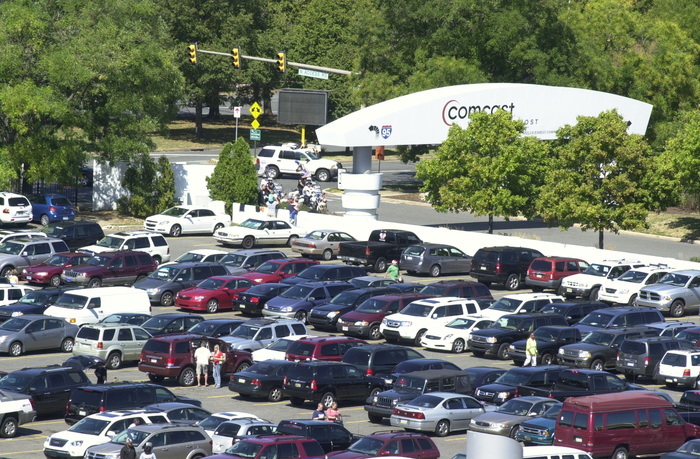 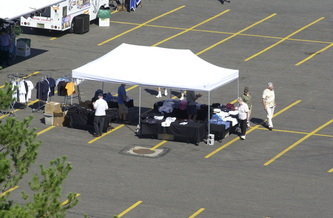 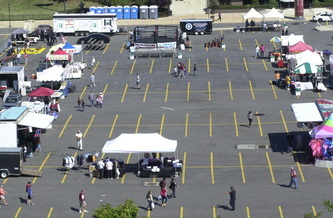 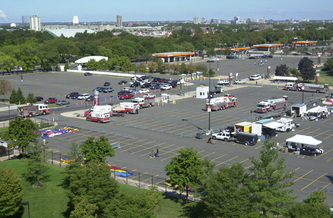 The 2010 event previews on Wednesday, September 1 at noon. 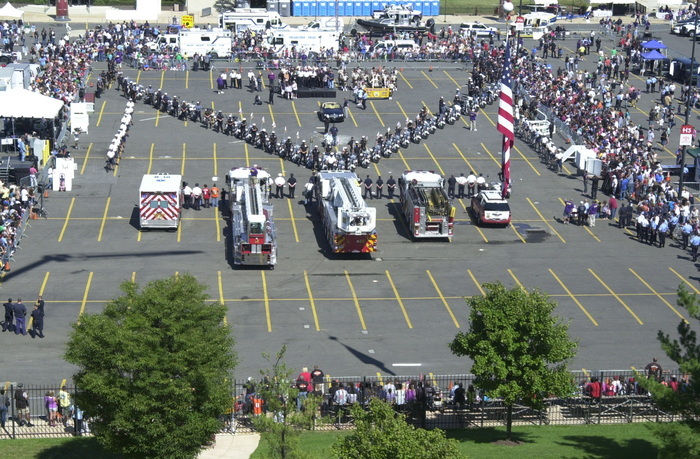 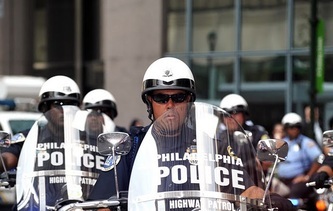 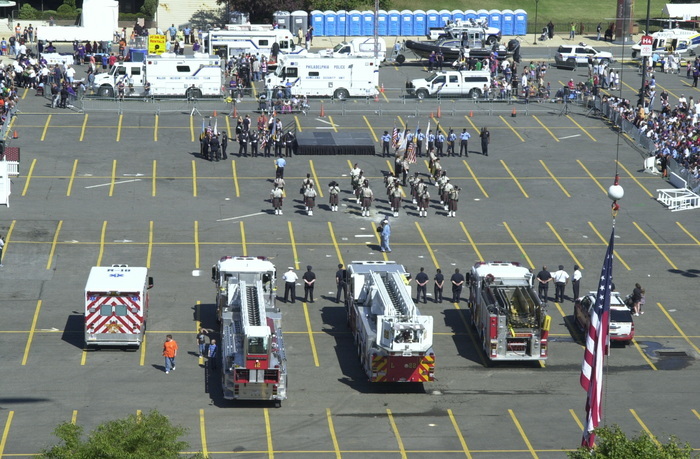 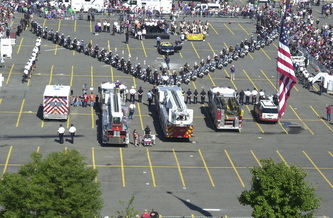 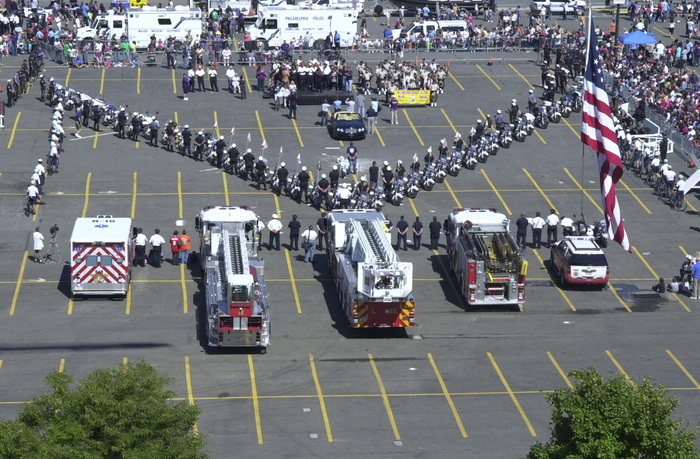 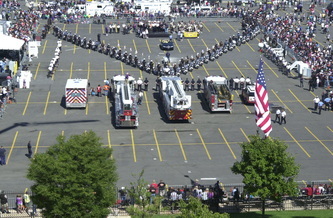 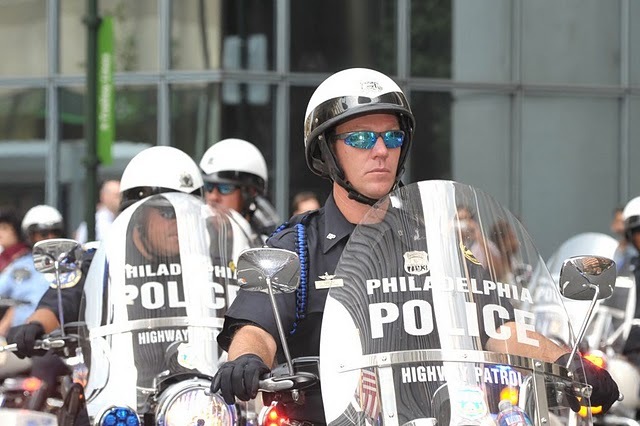 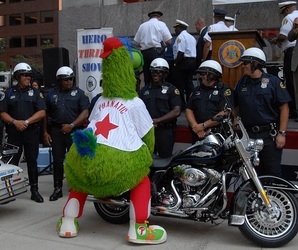 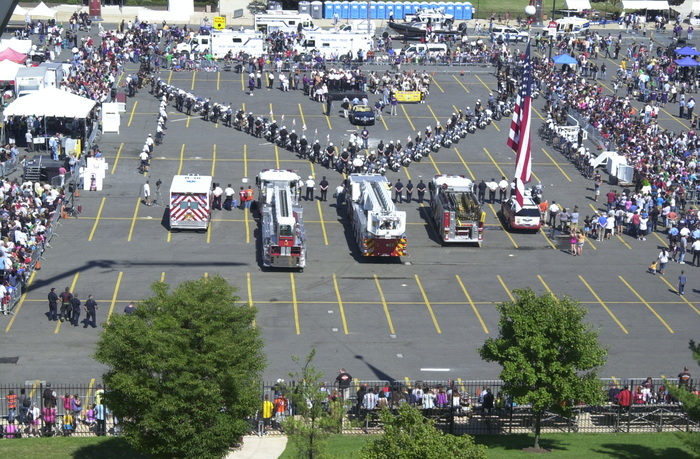 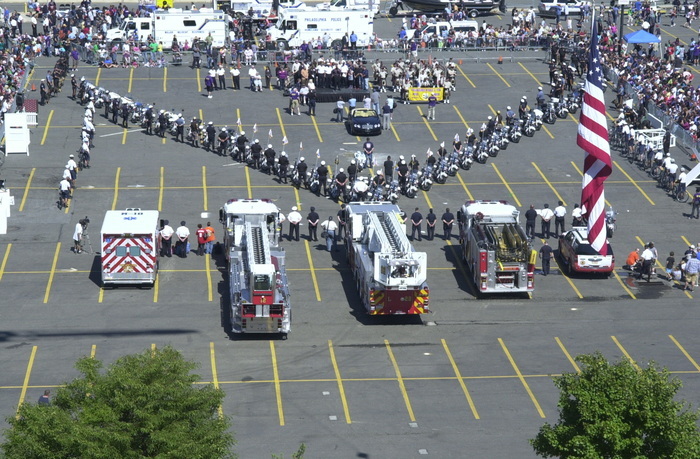 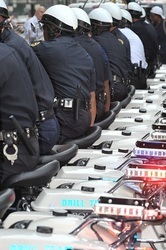 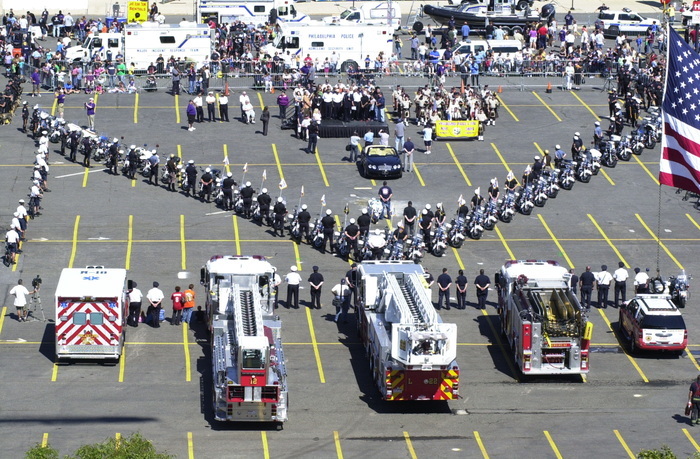 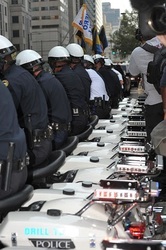 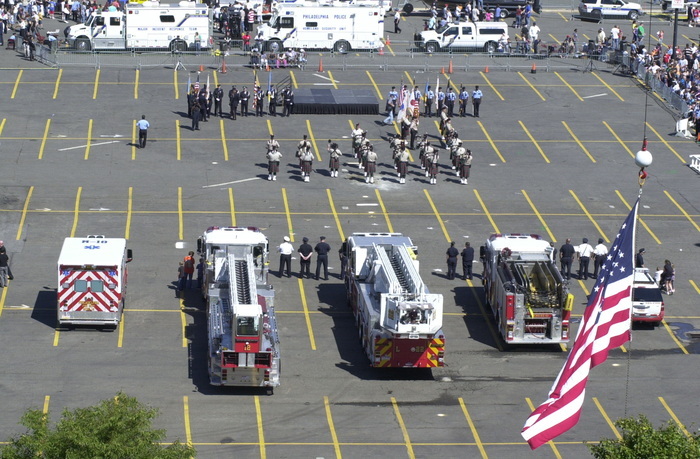 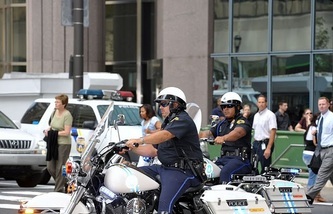 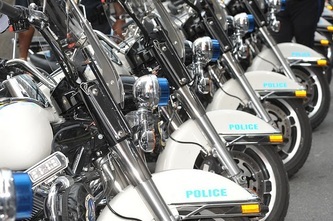 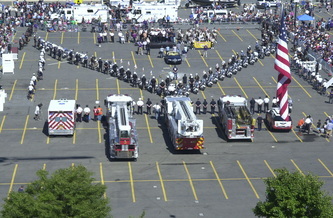 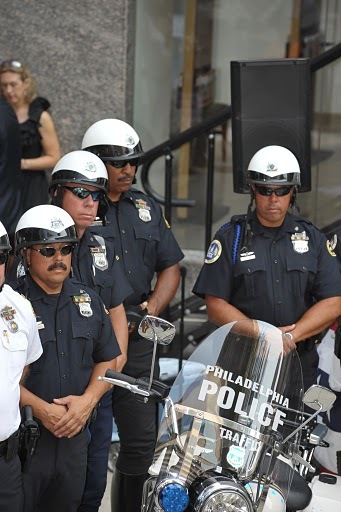 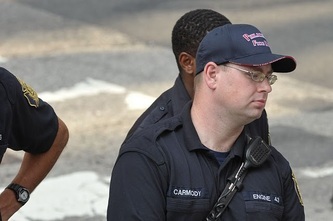 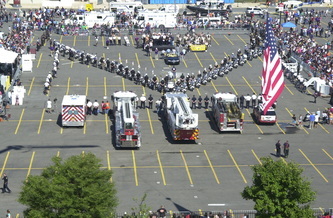 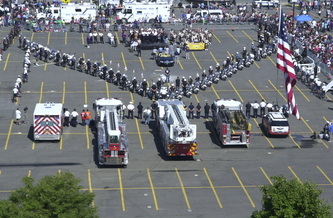 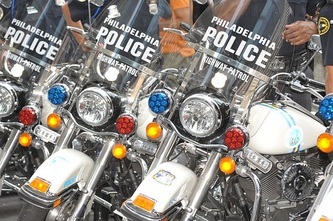 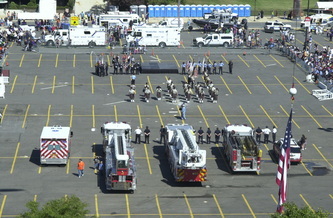 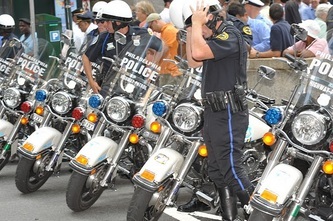 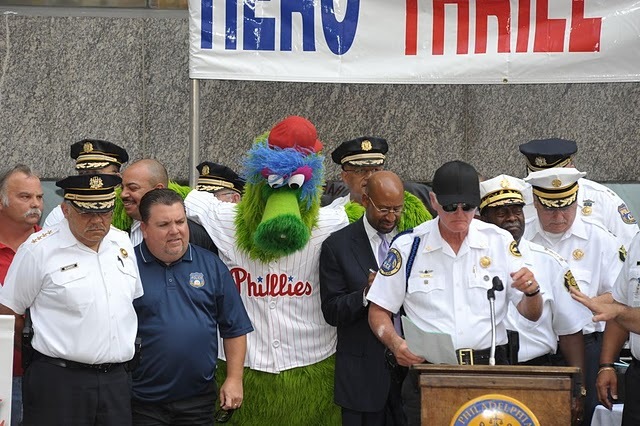 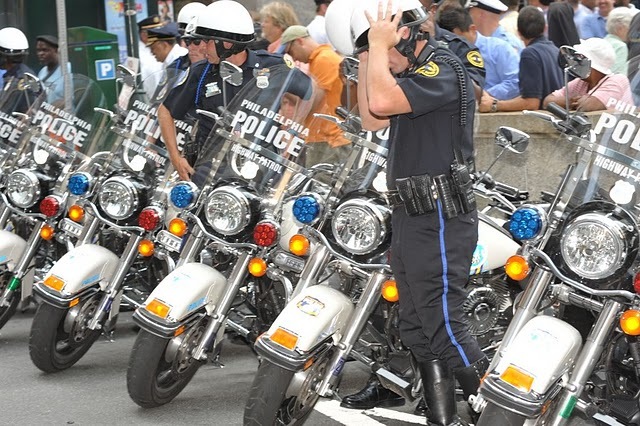 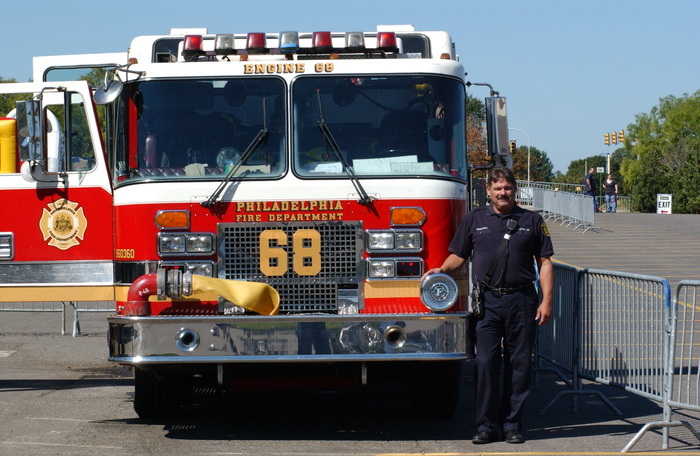 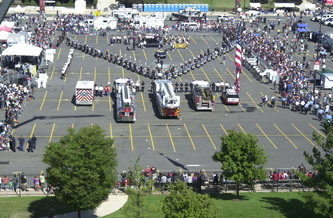 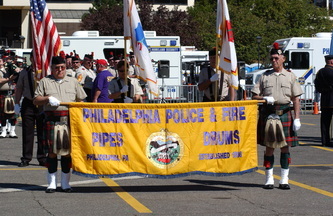 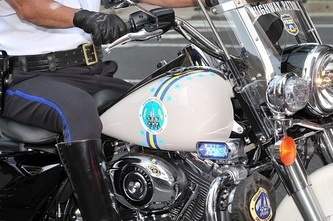 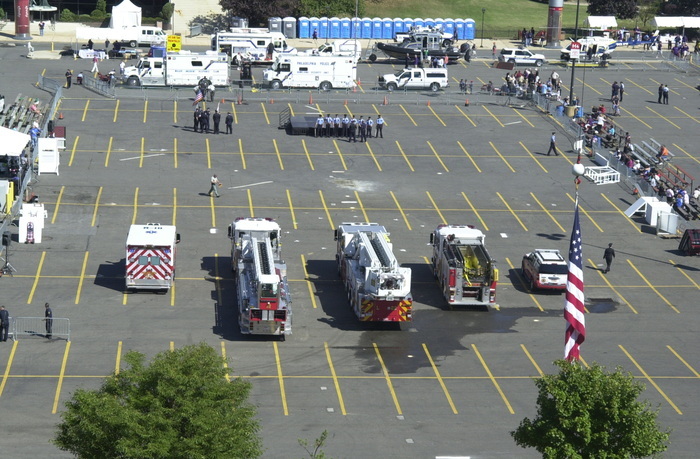 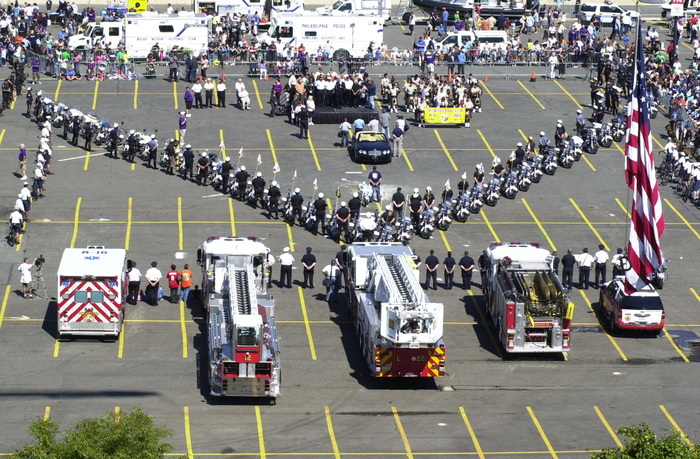 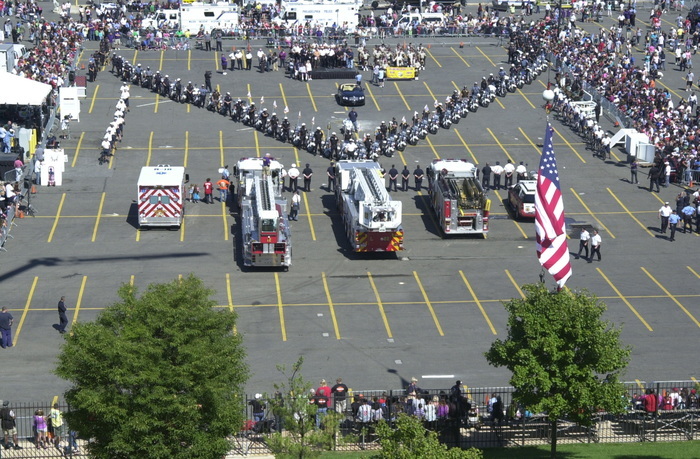 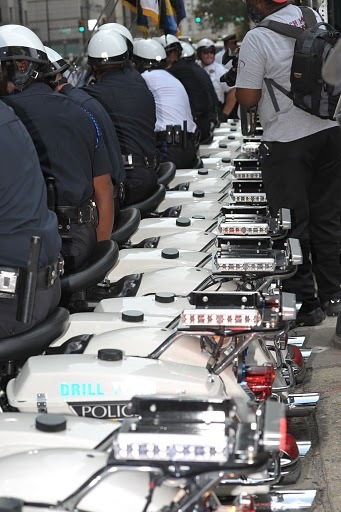 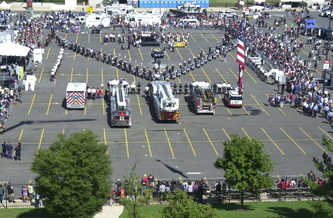 The Philadelphia motorcycle drill team, a fleet of fire engines, the Phillie Phanatic and more offer a processional tribute to fallen police and firefighting heroes. 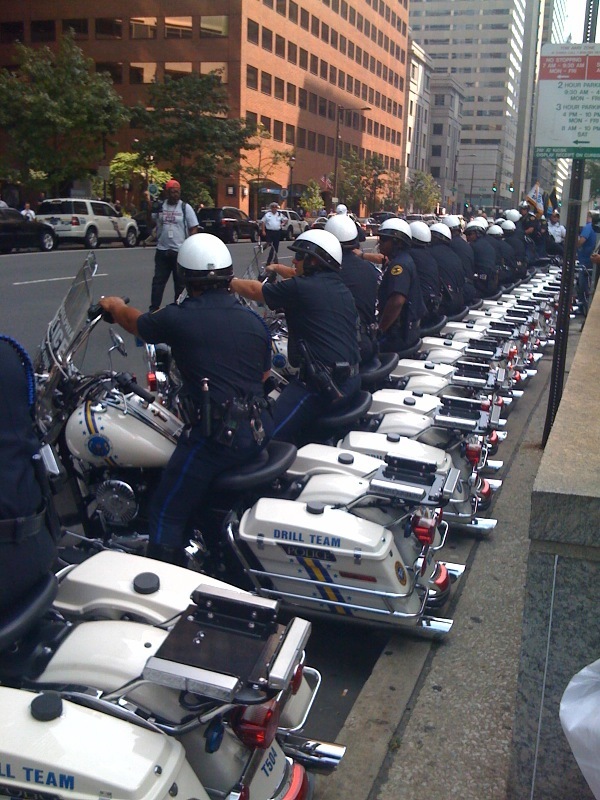 Viewers can expect the procession to move south down 19th Street and left on Market to the rally in front of the centrally located Marathon Grill at 1818 Market Street. 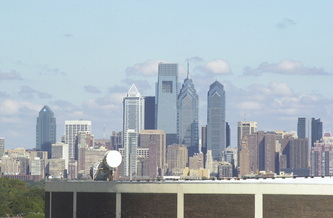 A preshow cocktail party kicks off the next day at the same location in Center City Philadelphia. 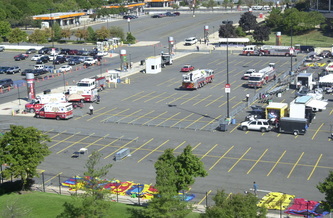 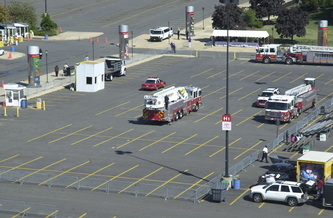 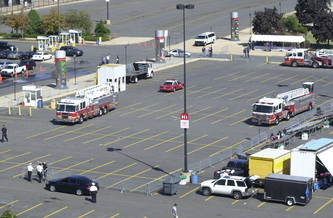 The Hero Show Cocktail Party is featured in the Grill on Thursday, September 2 from 5 p.m. - 9 p.m.
Sixteen days later, every unit in the fire department will put the "thrill" in the Hero Thrill Show. 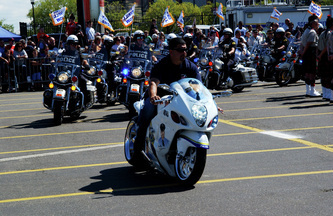 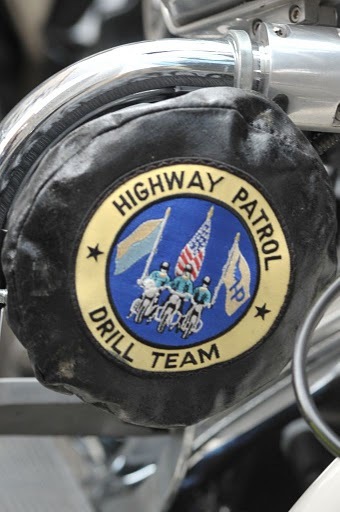 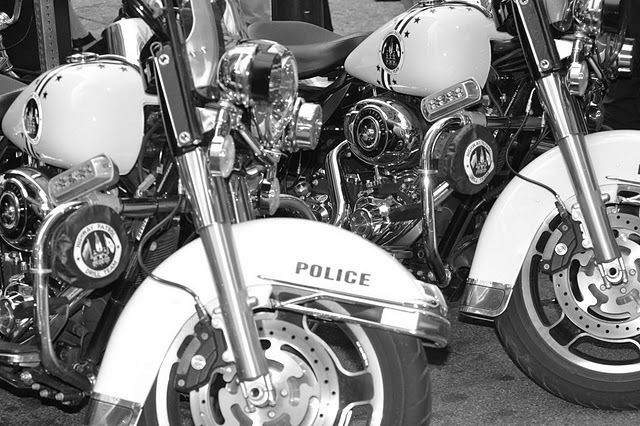 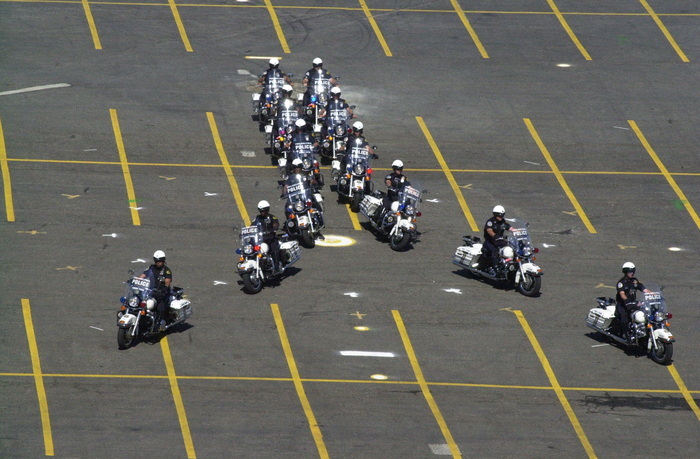 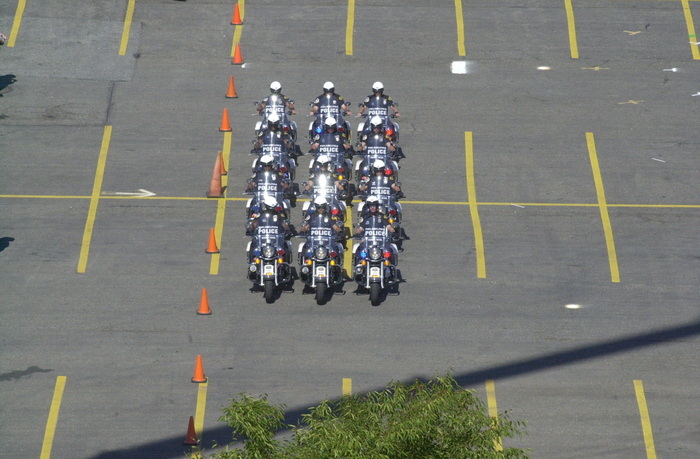 Joining them are eight law enforcement units from the bomb squad, aviation unit, and K-9 unit to the highway patrol motorcycle dream team. 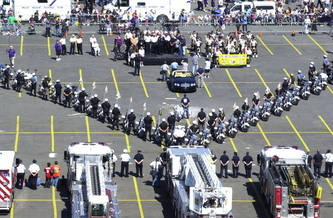 All will perform to entertain visitors and contribute to a worthy cause. 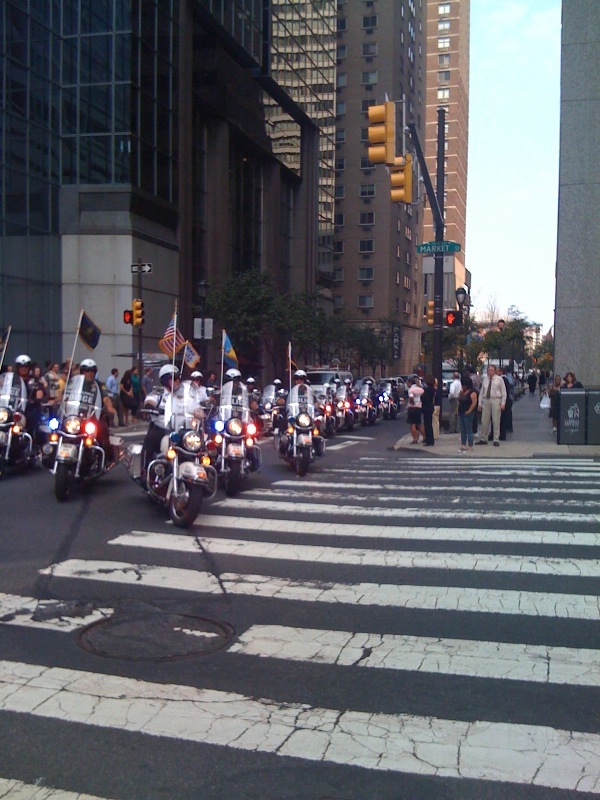 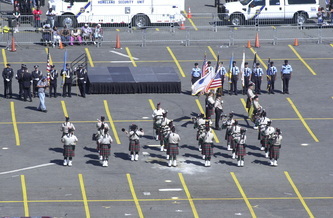 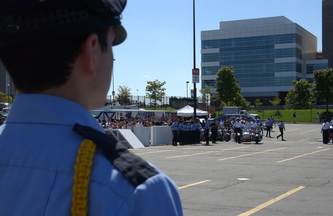 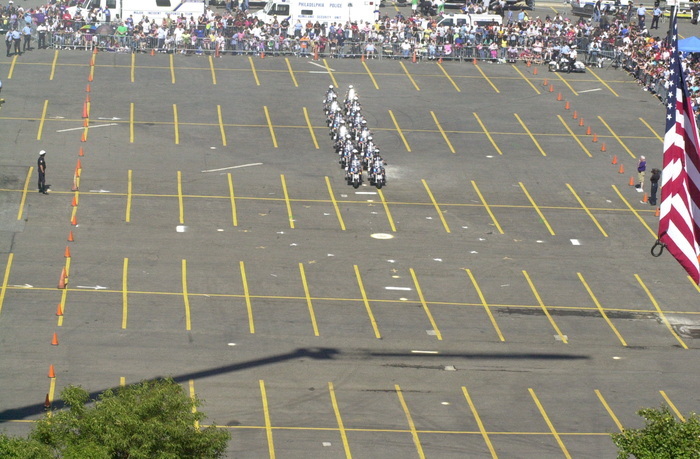 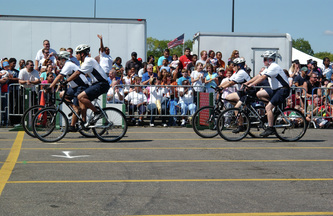 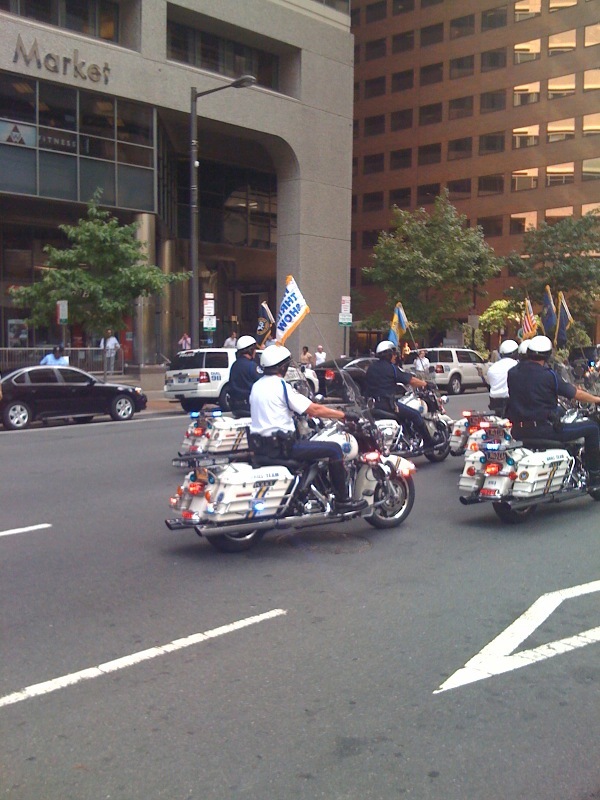 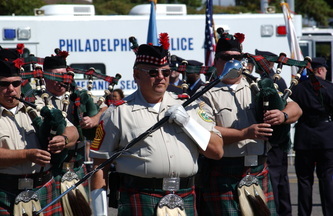 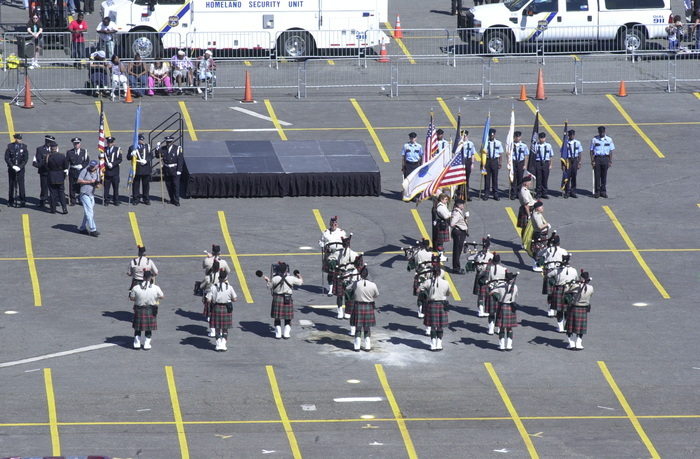 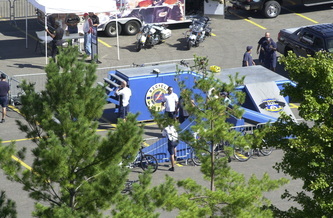 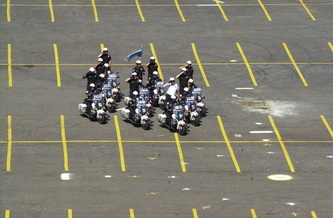 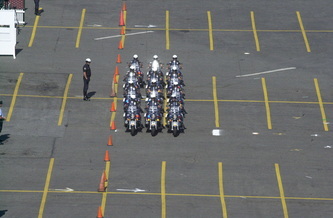 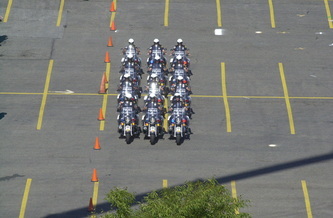 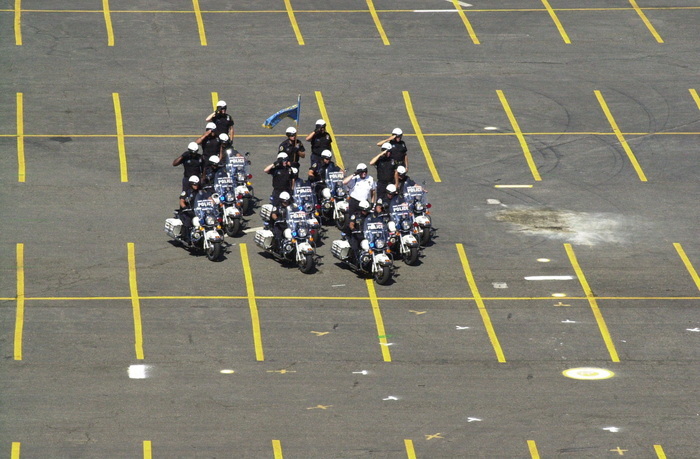 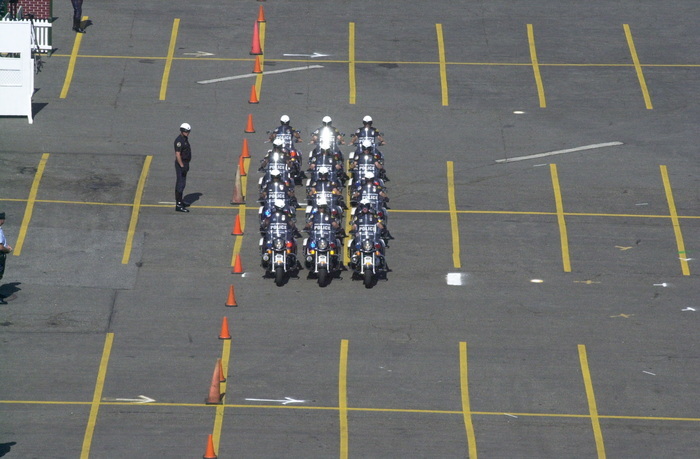 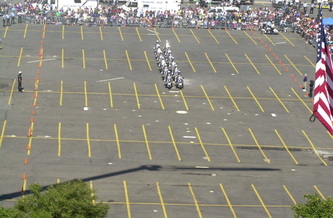 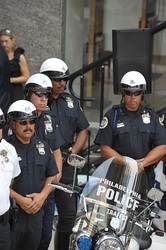 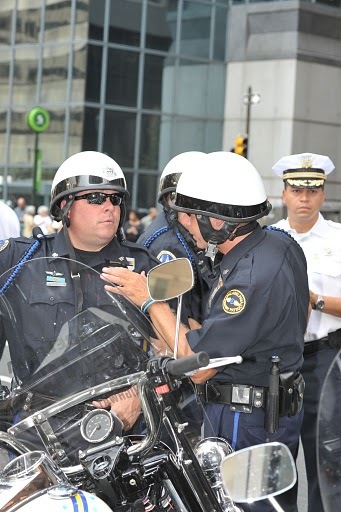 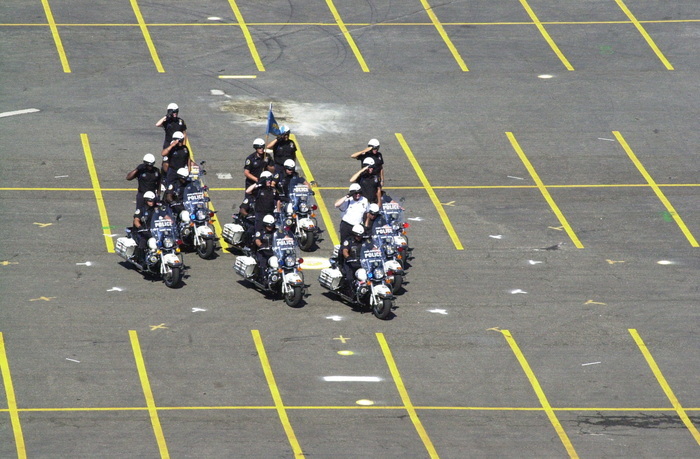 The Strike Force Bicycle Stunt Team, new to the show, and the traditional Philadelphia Police & Fire Pipes and Drums also intend to please crowds of ages. 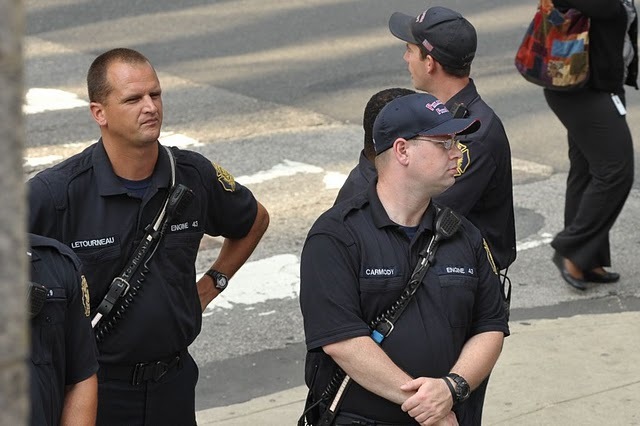 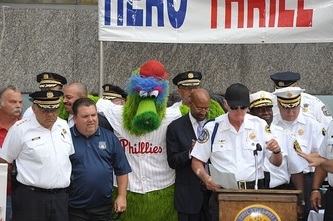 For folks wondering how crimes are solved or how fires are extinguished, wonder no longer. 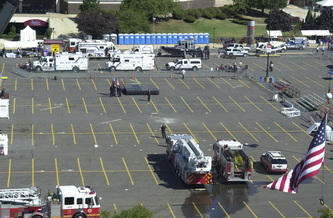 The crime scene unit and other police and fire equipment will be on hand. 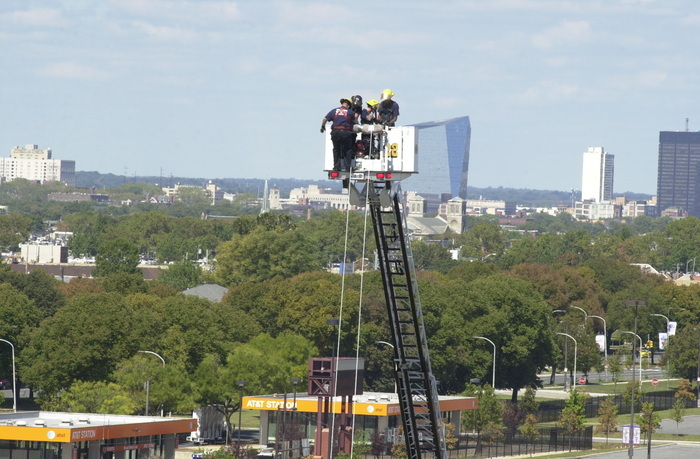 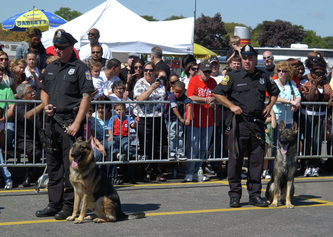 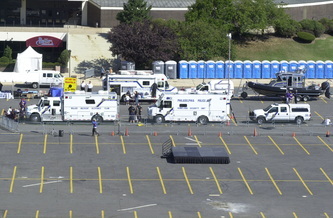 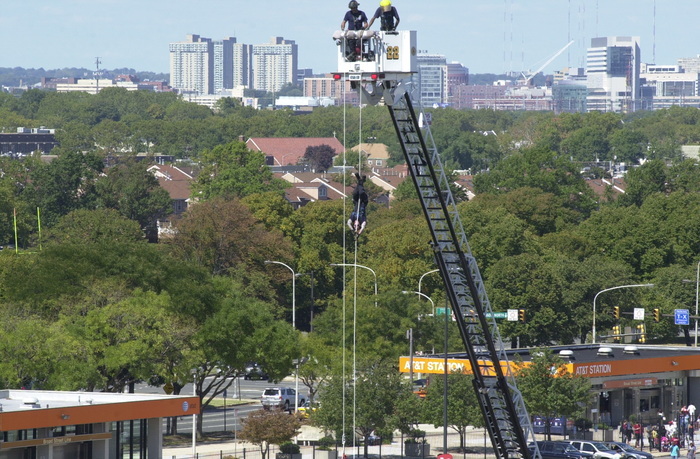 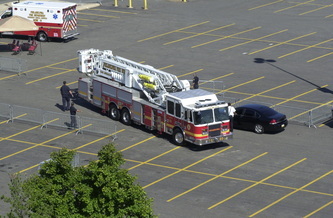 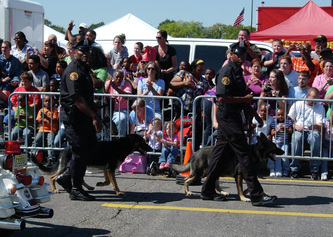 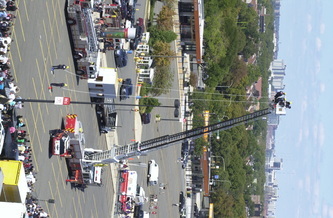 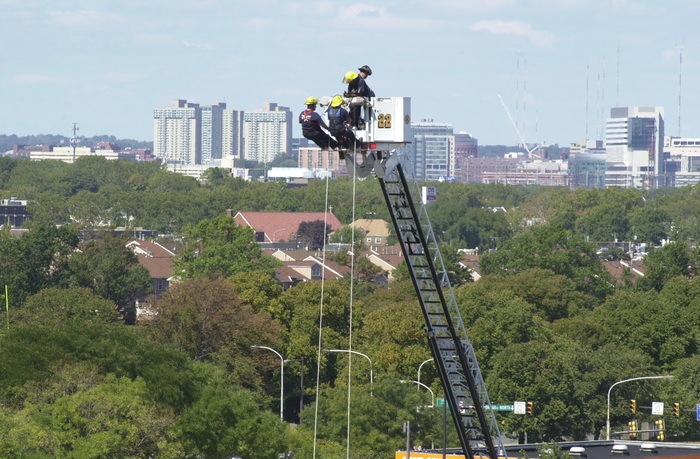 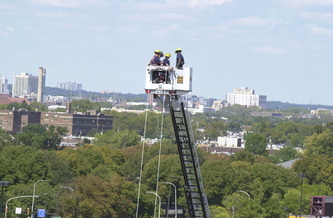 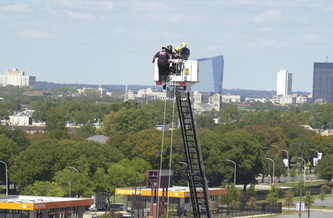 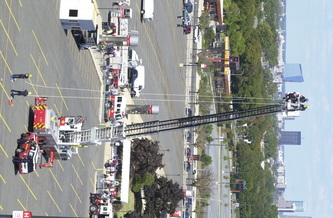 They come with live demonstrations, such as exciting fire and rescue exhibitions. 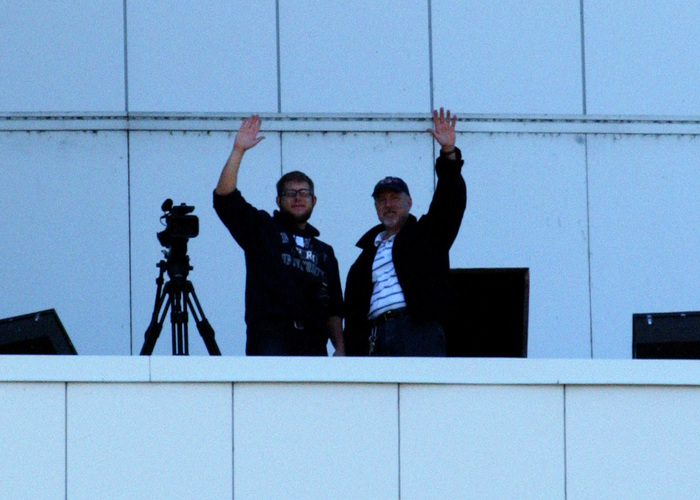 Sports fans are not forgotten either. 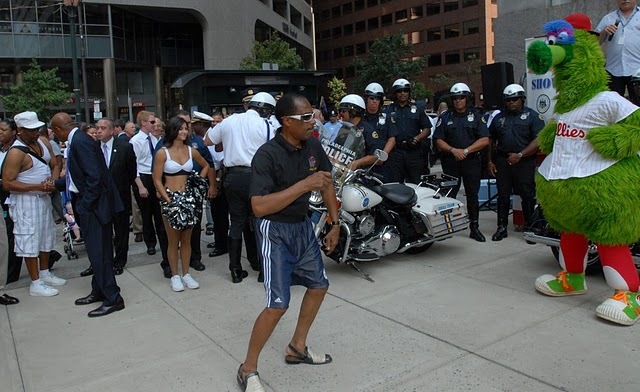 The new Sonny Hill basketball shootout competition along with popular team mascots, the Sixers Dancers and Eagles Cheerleaders plan to wow visitors. 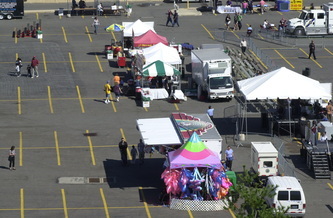 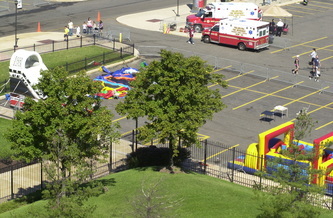 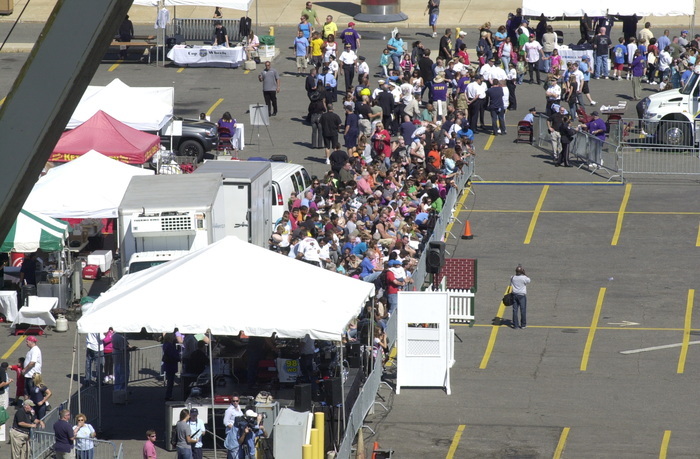 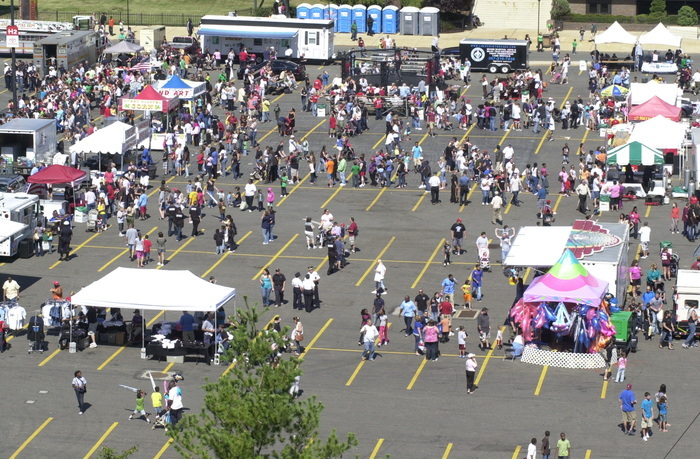 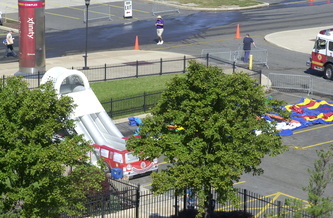 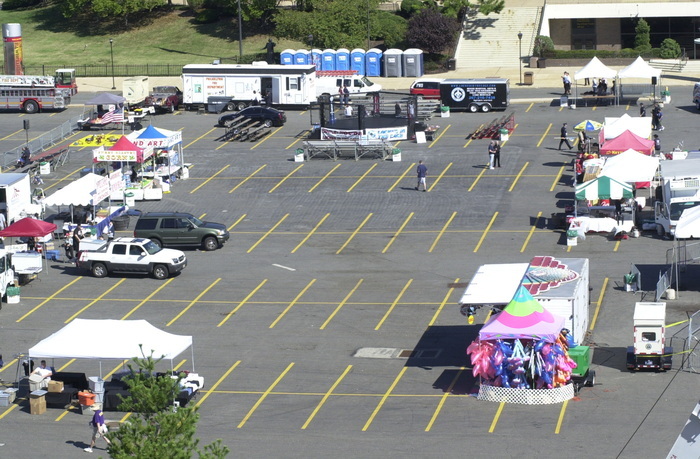 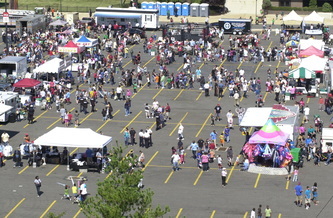 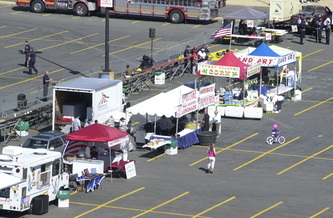 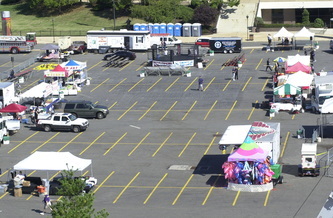 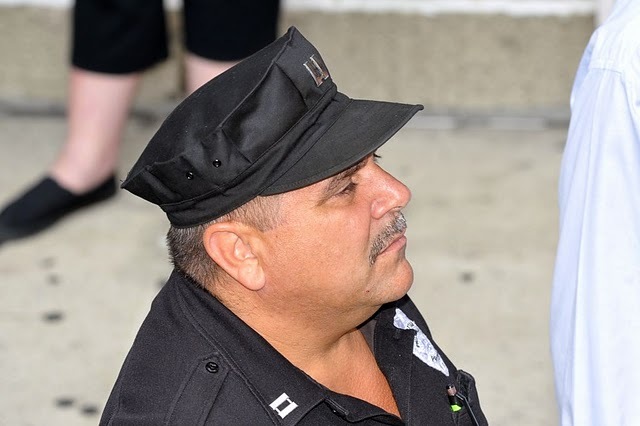 In between those attractions, musical entertainment by Bob Pantano of WOGL 98.1 and an old-fashioned carnival mid-way with food vendors, amusements, games, face-painting, and dunk tanks should keep both adults and children busy. 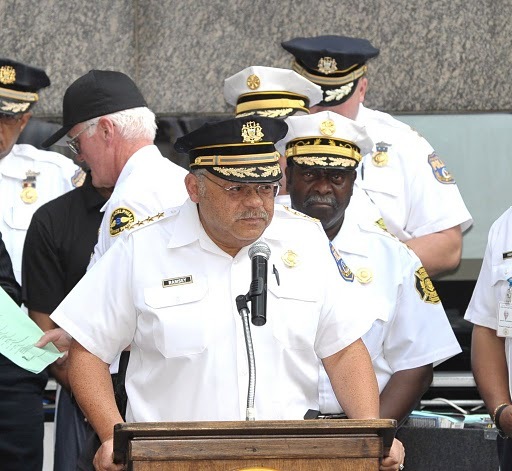 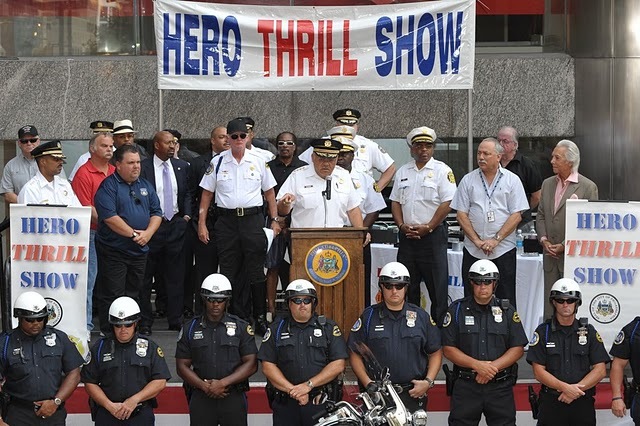 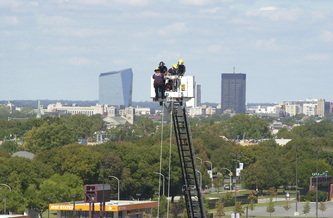 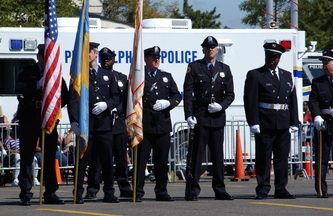 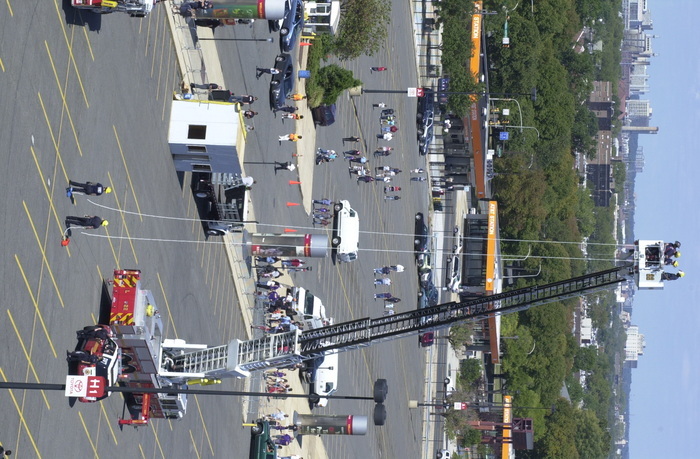 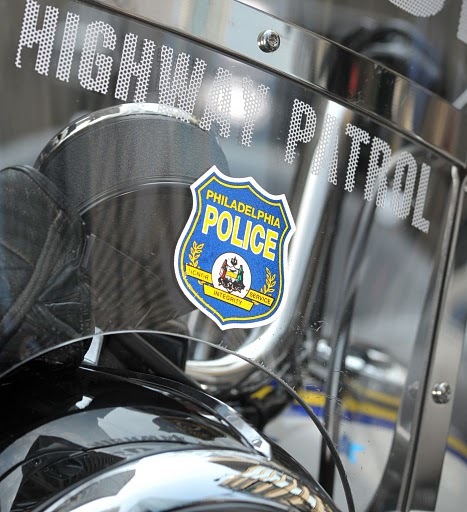 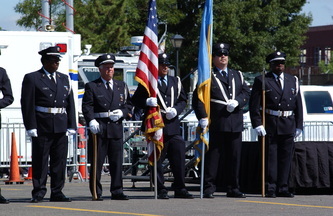 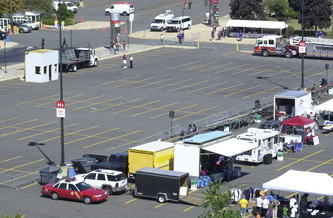 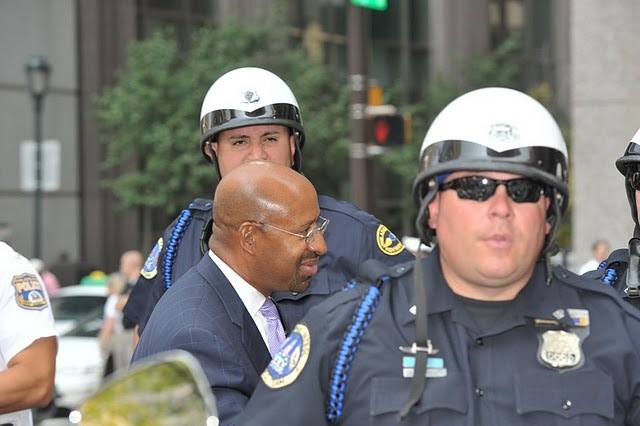 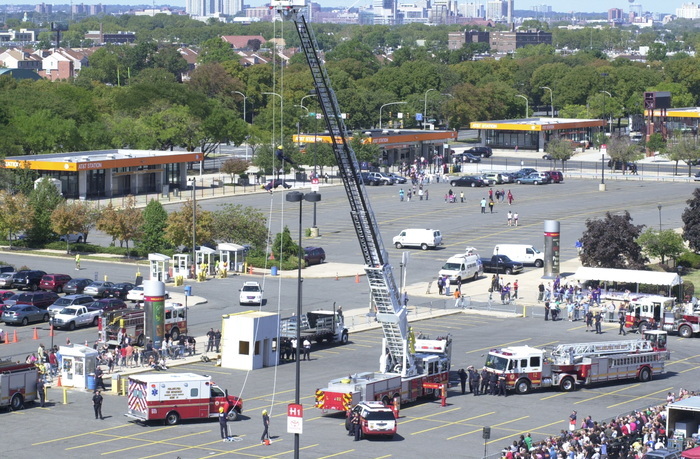 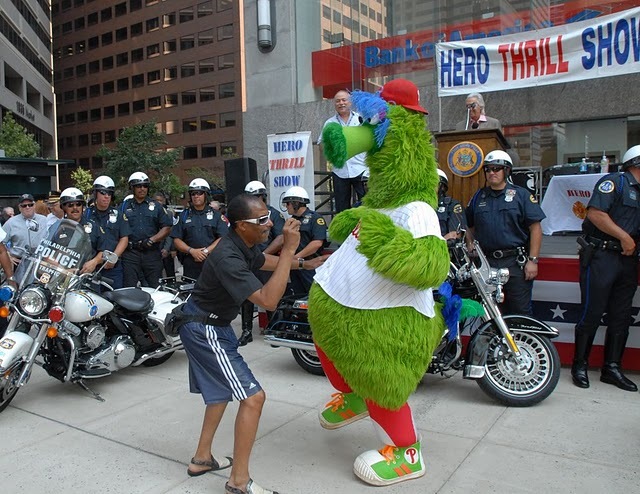 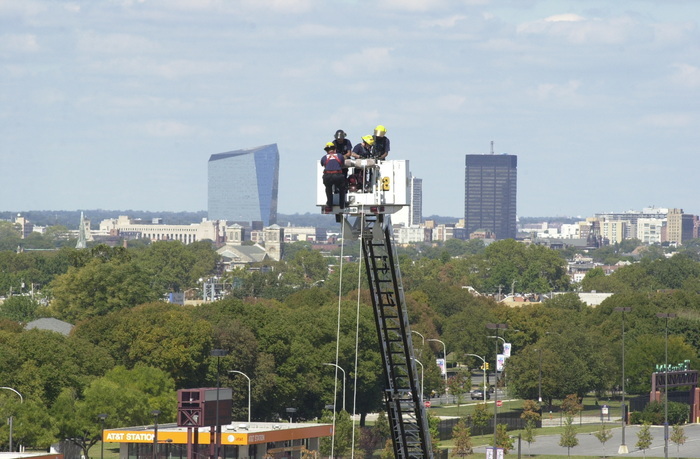 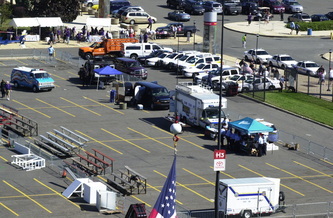 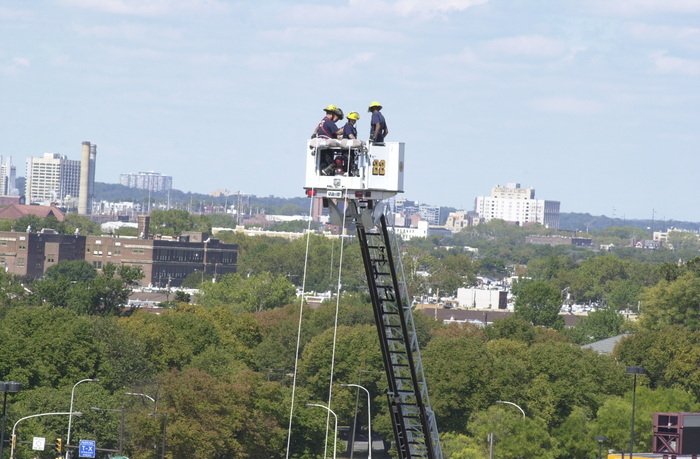 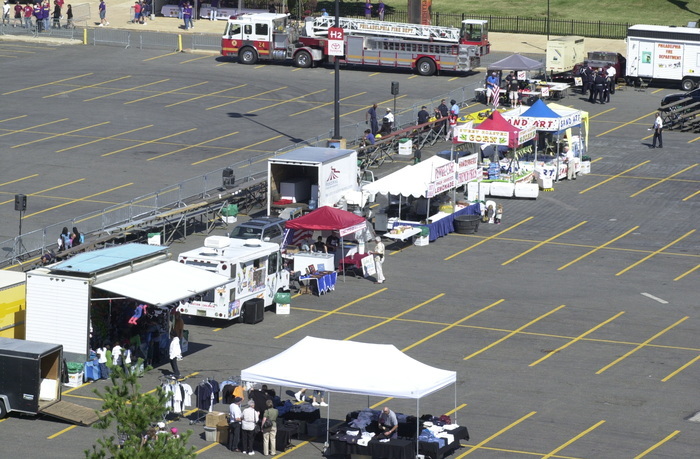 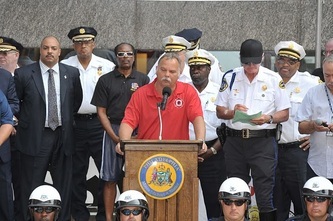 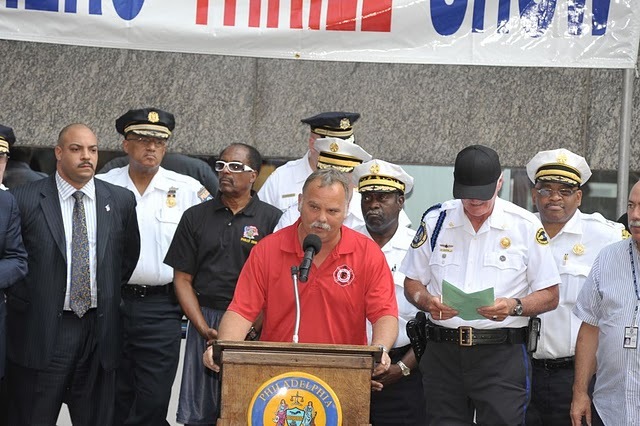 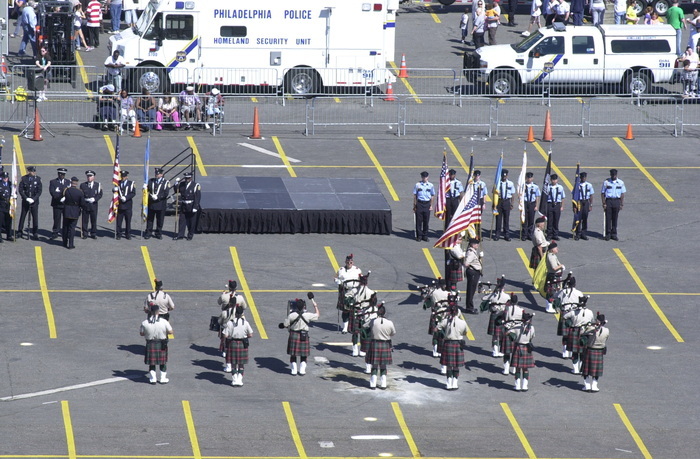 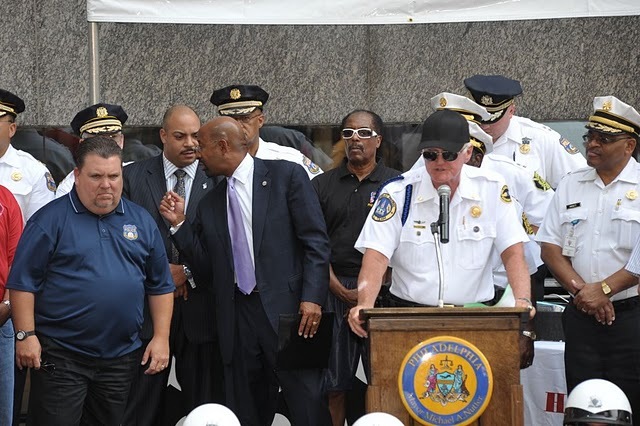 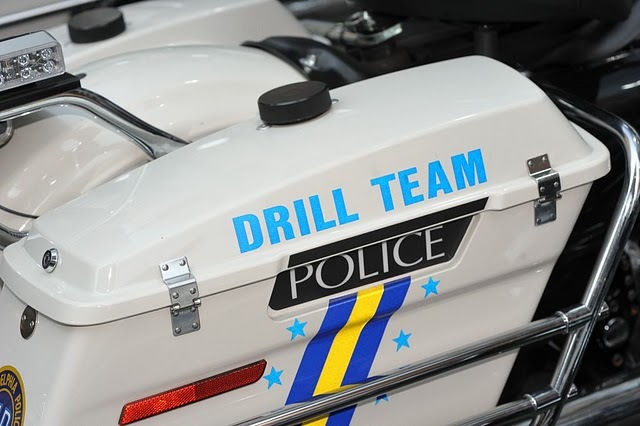 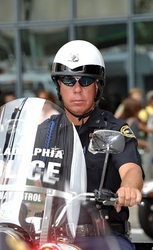 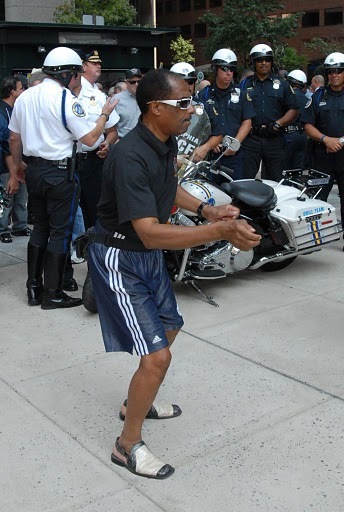 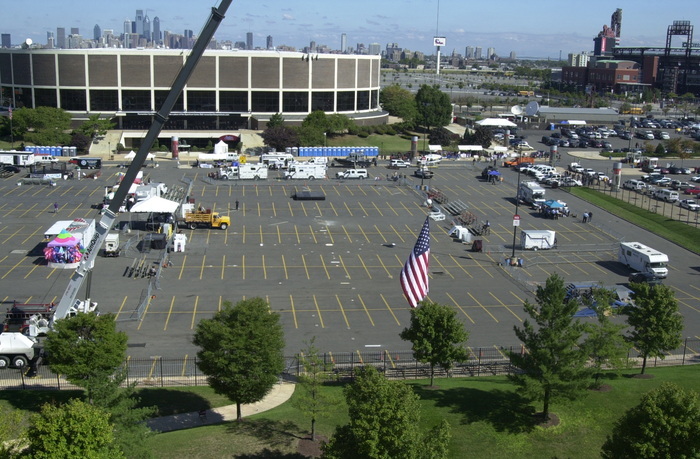 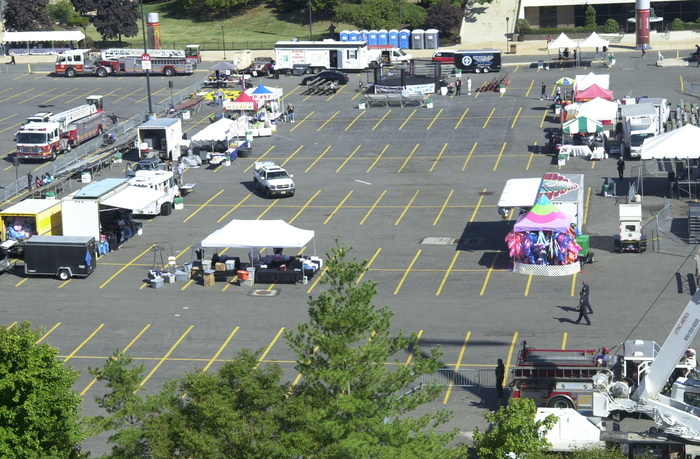 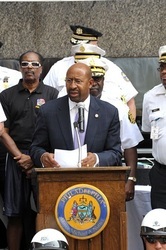 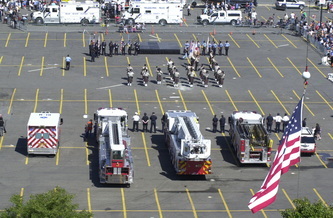 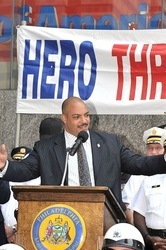 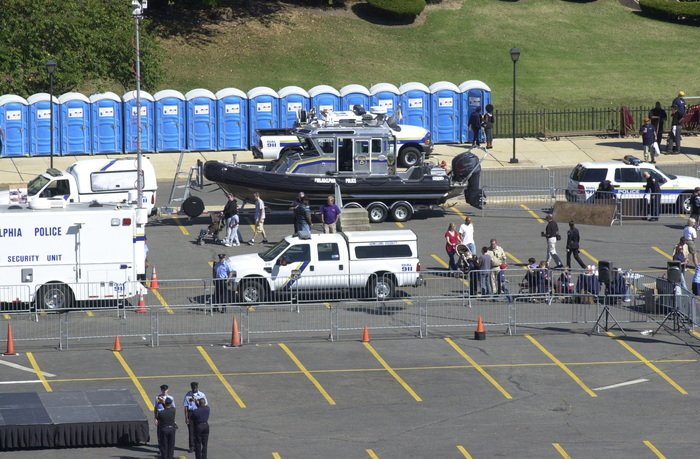 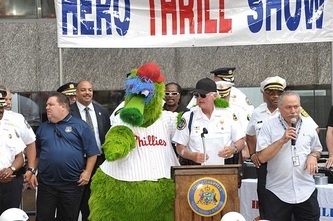 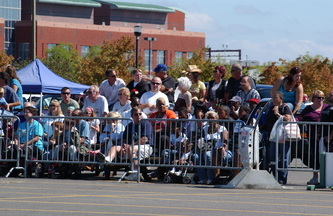 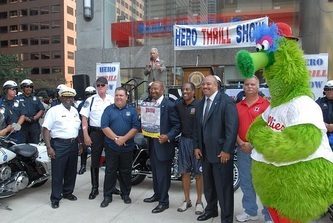 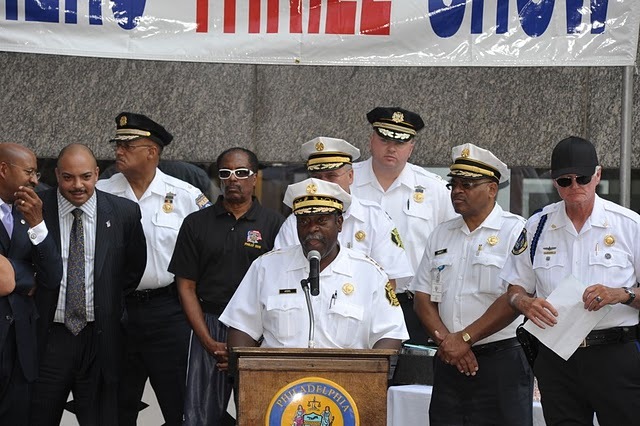 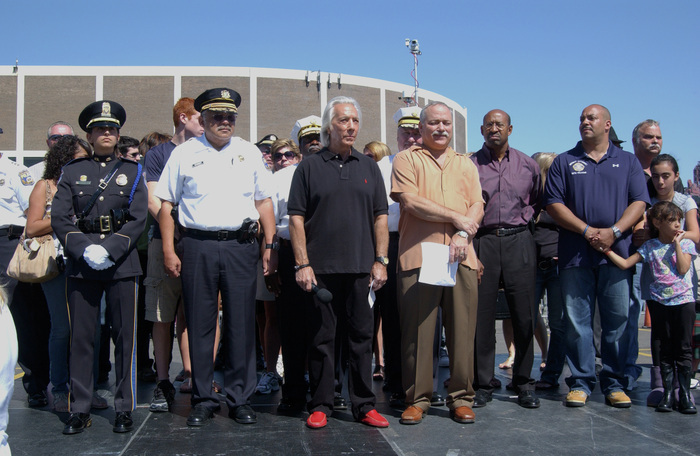 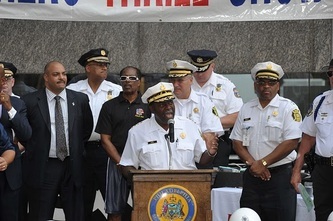 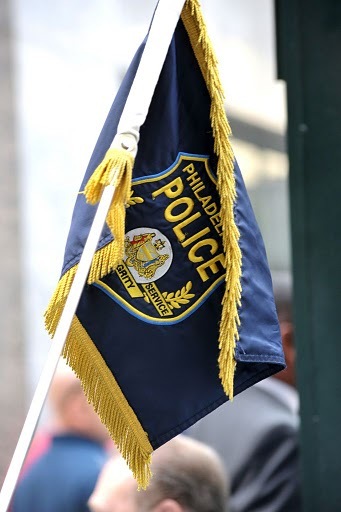 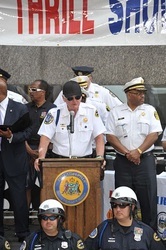 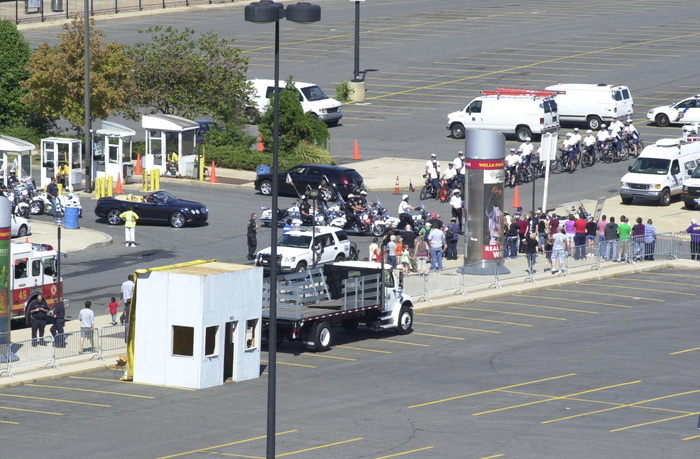 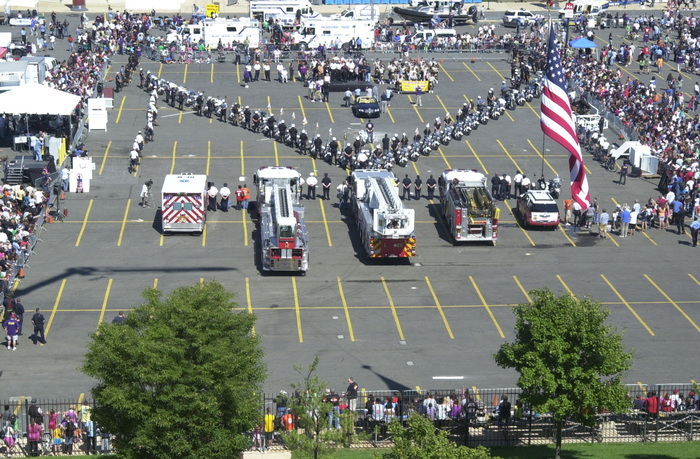 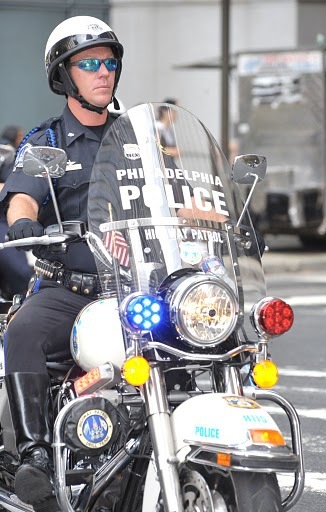 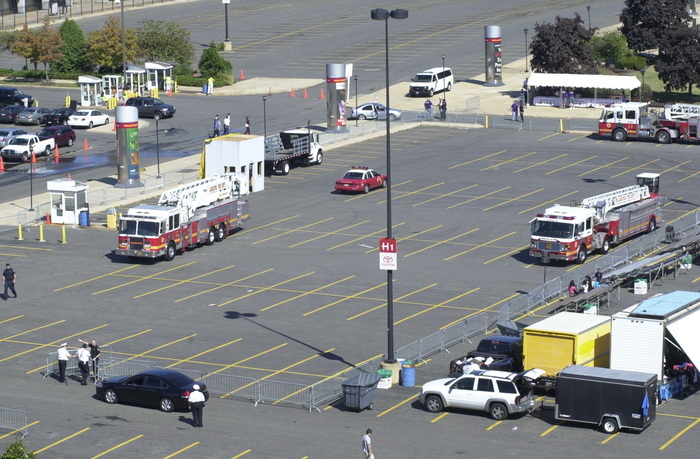 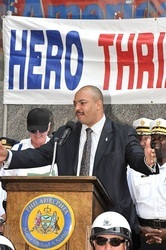 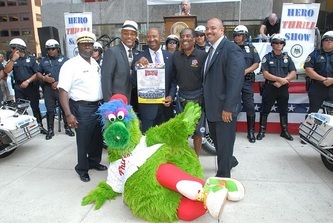 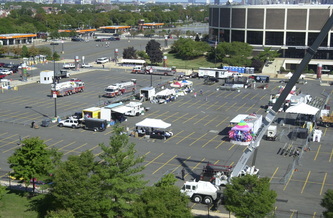 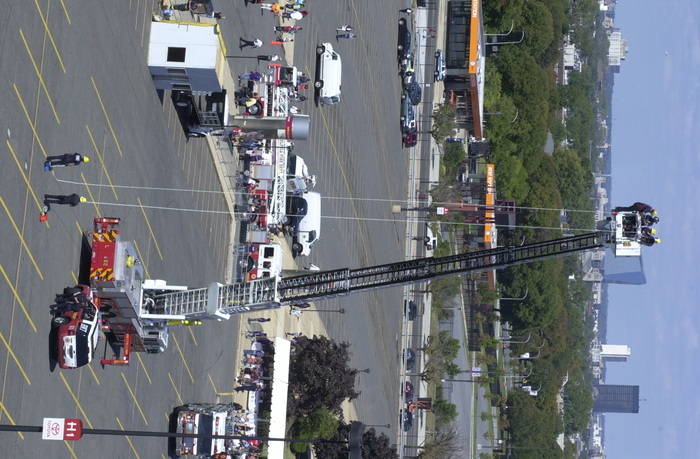 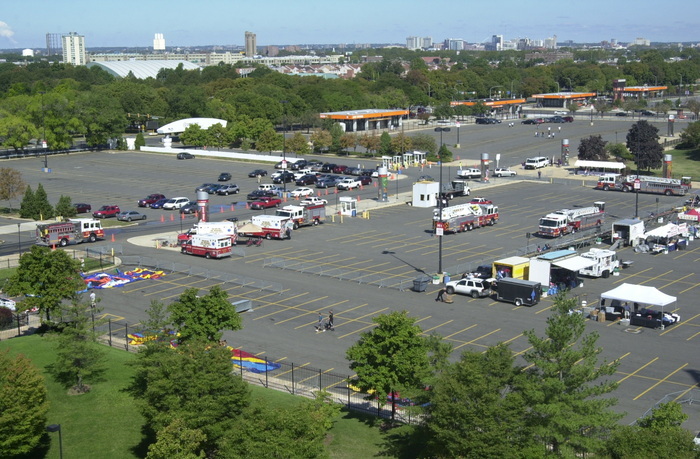 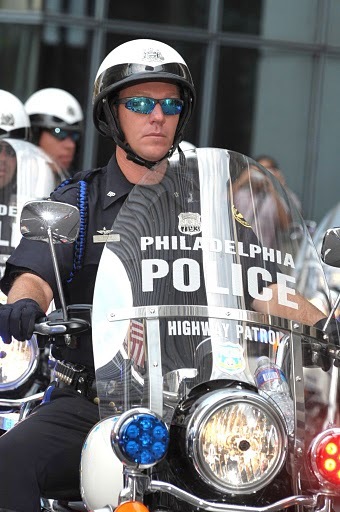 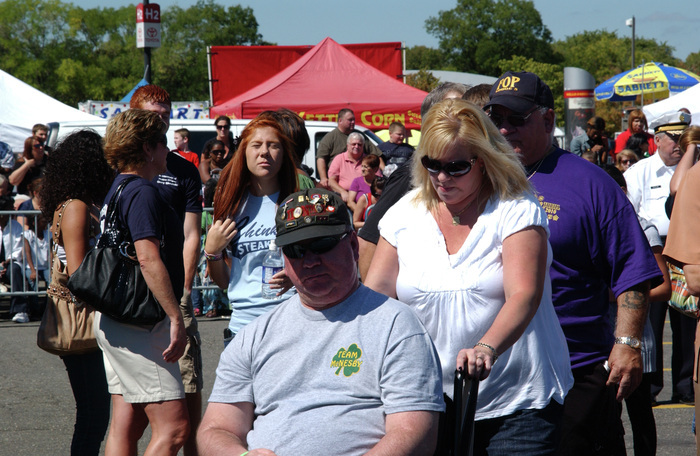 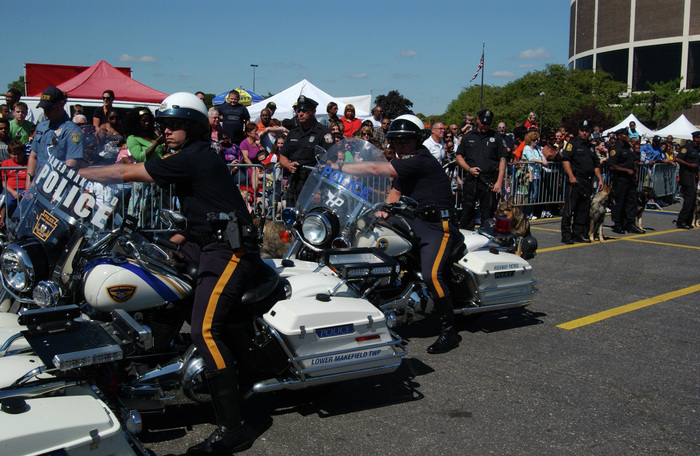 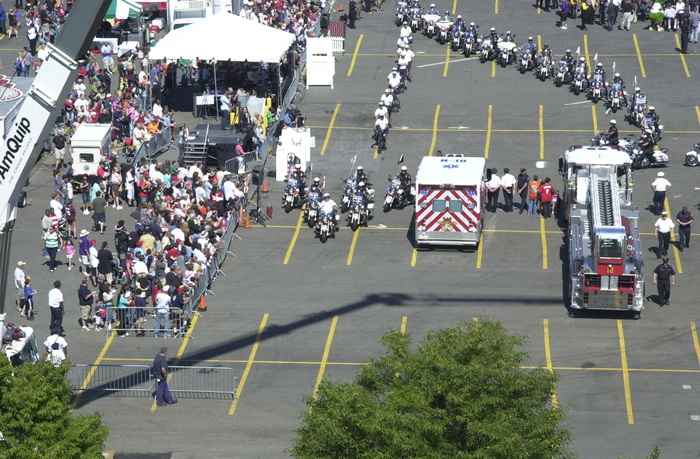 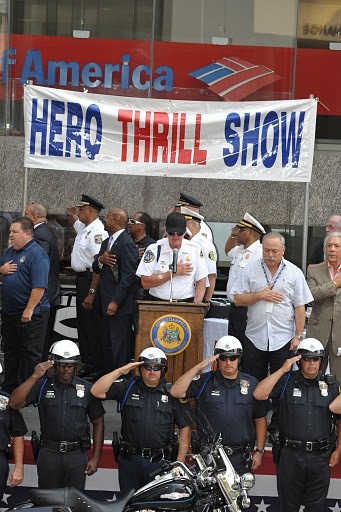 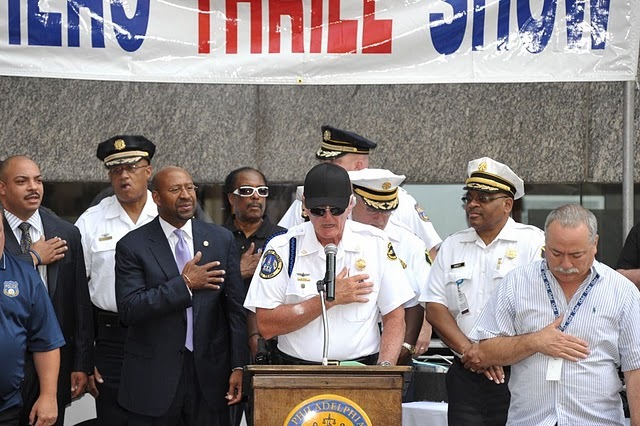 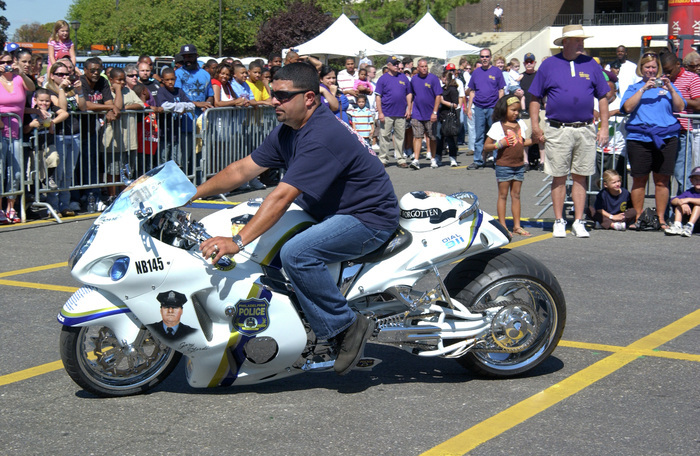 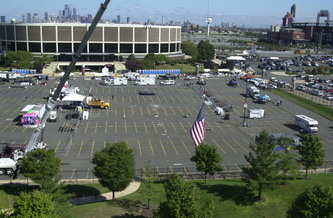 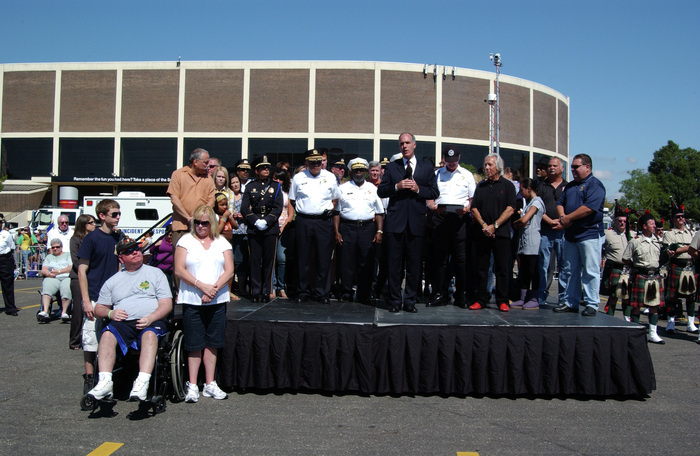 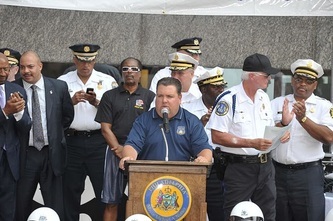 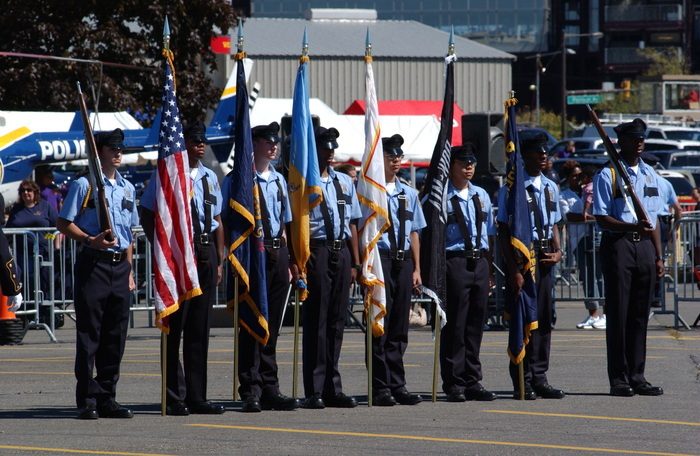 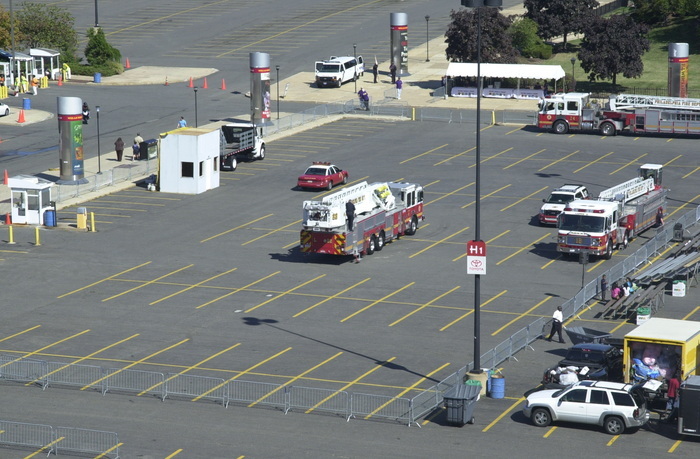 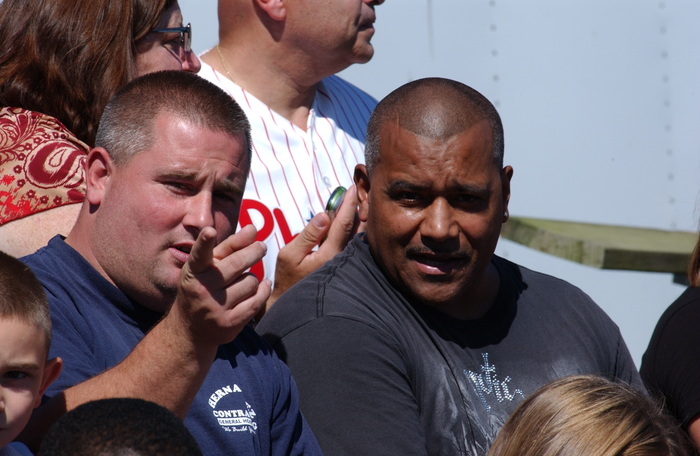 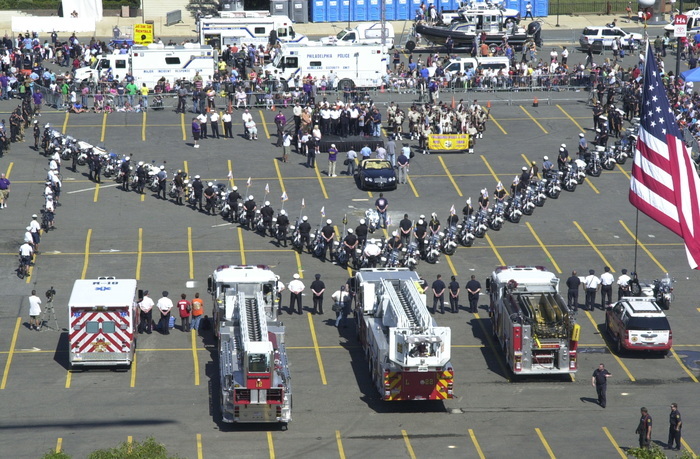 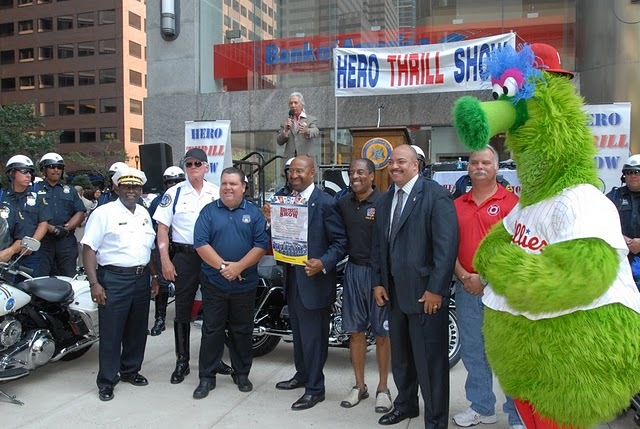 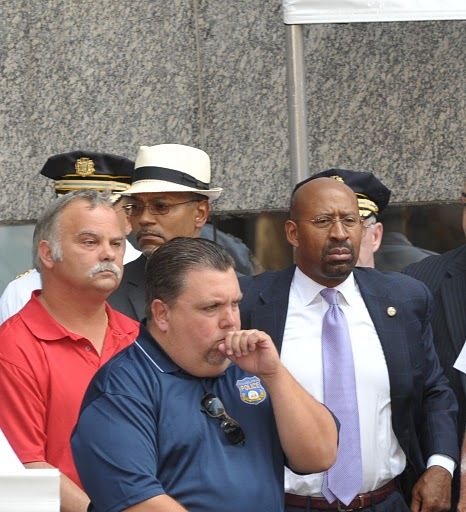 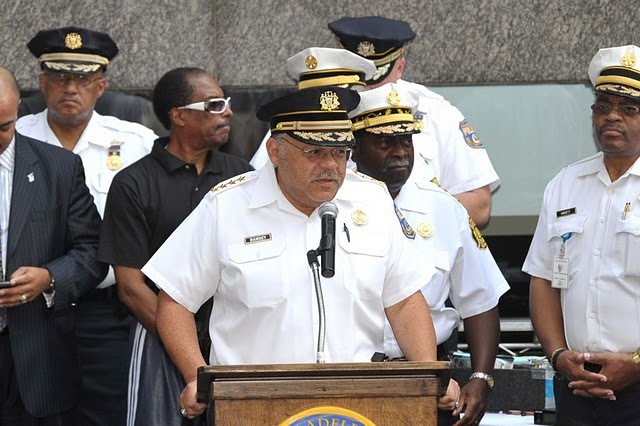 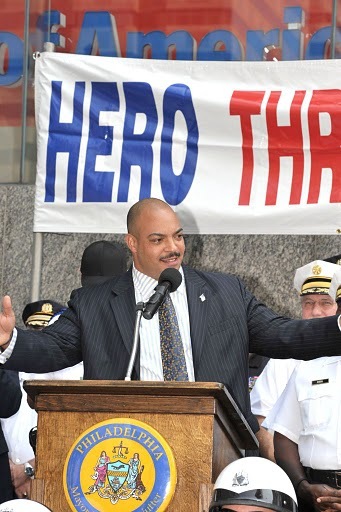 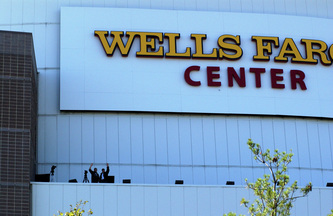 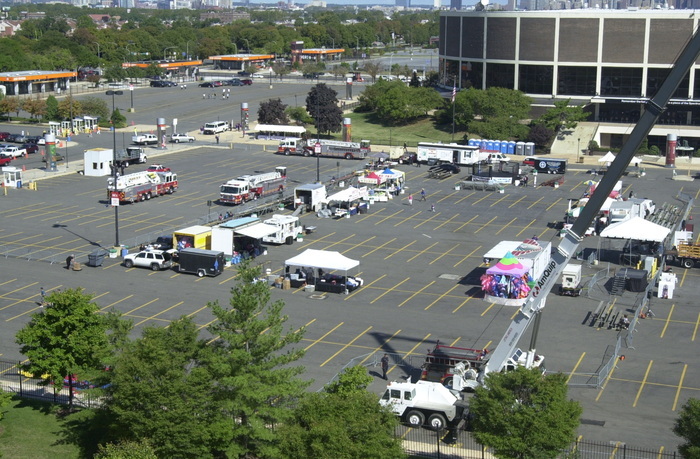 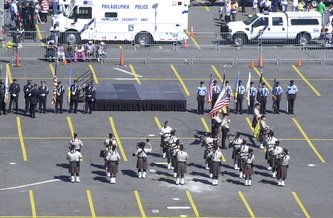 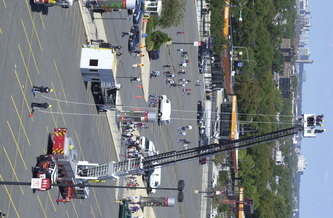 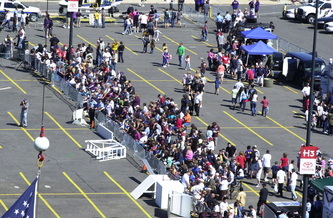 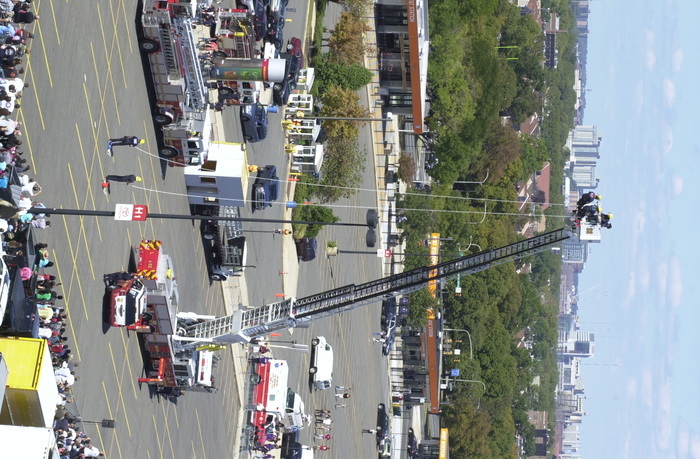 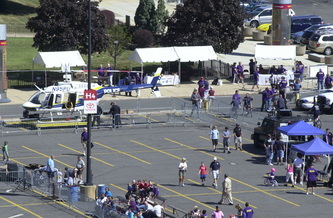 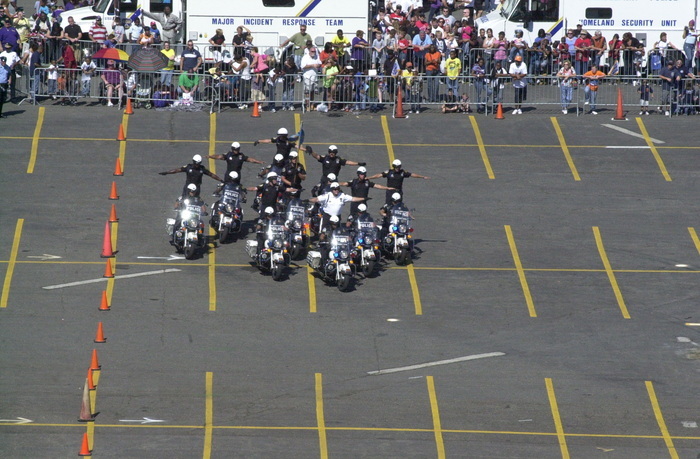 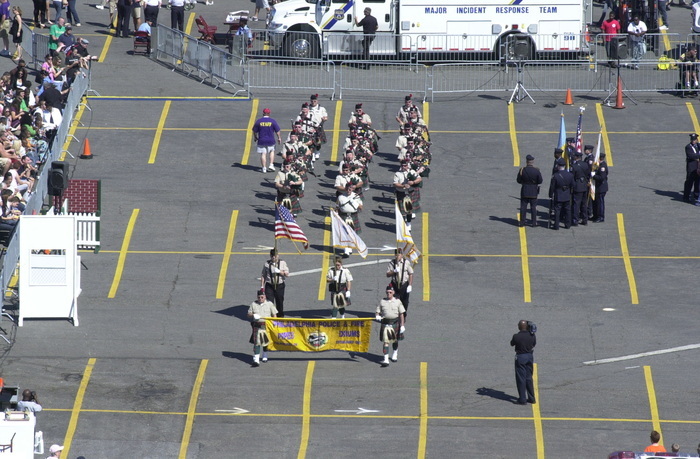 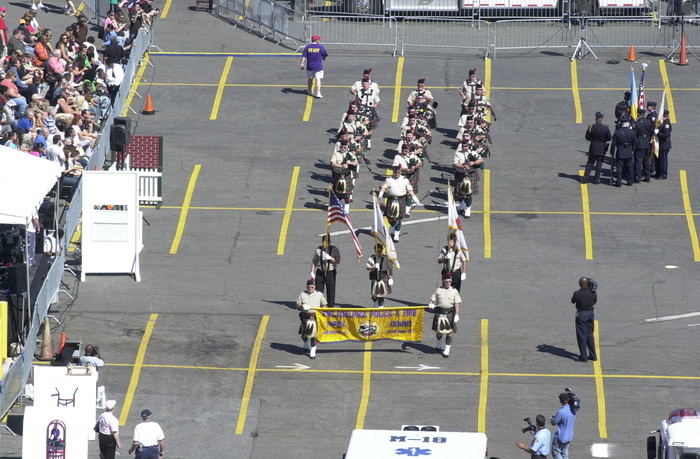 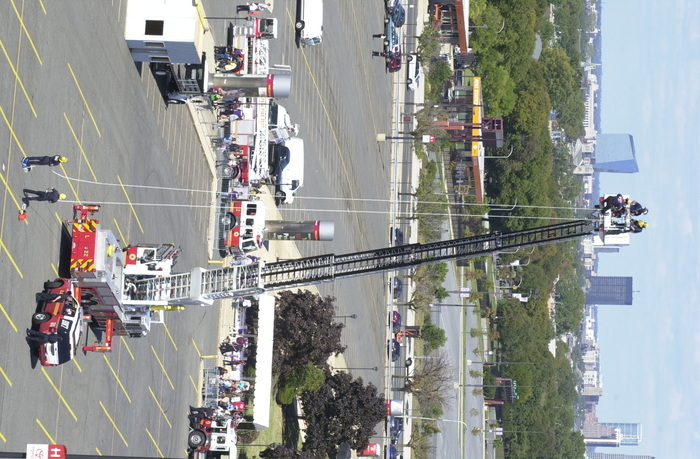 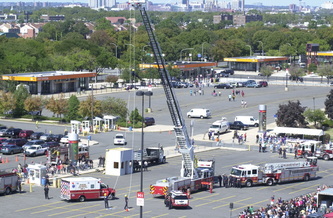 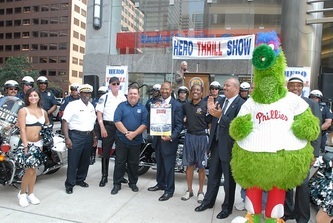 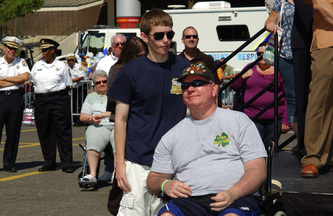 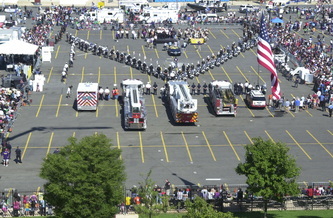 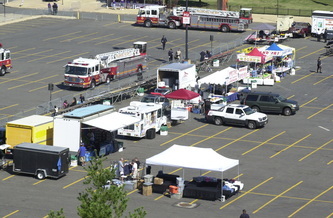 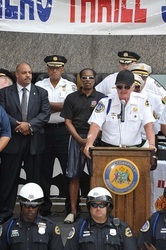 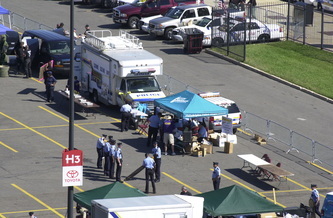 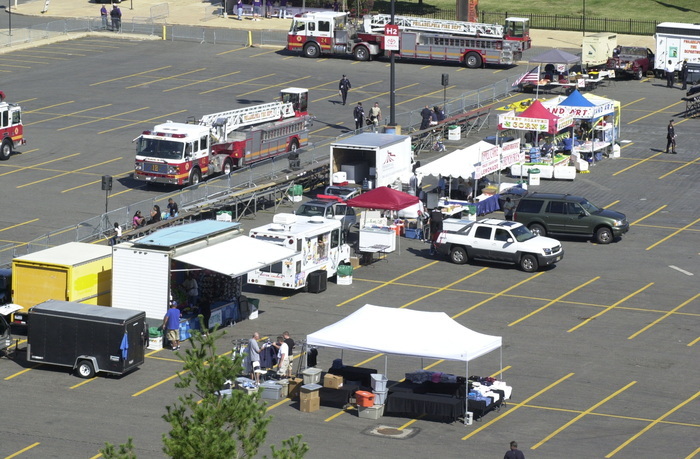 Once again, if weather permits, the date of the Hero Thrill Show is Saturday, September 18 from 12 p.m. - 5 p.m. outside the Wells Fargo Center located at 3601 Broad Street in South Philadelphia. 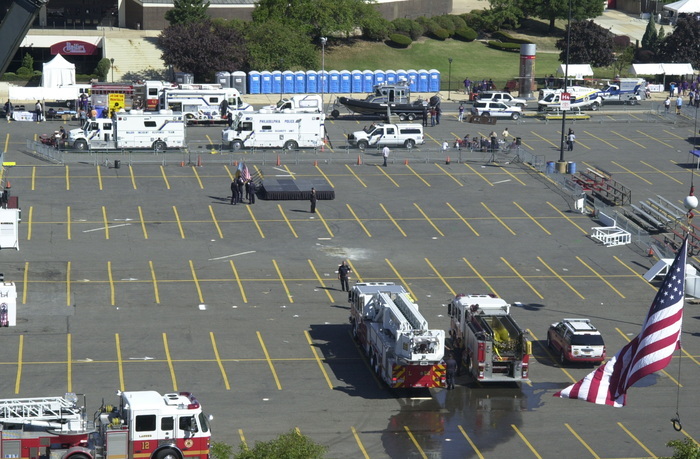 The show's rain date is Sunday, September 19. 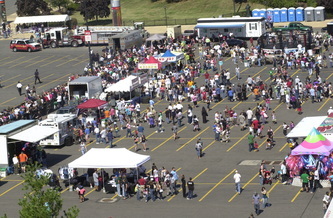 Tickets costing $10 per person and $25 per family of four are available at local police and fire stations and online at www.comcasttix.com. 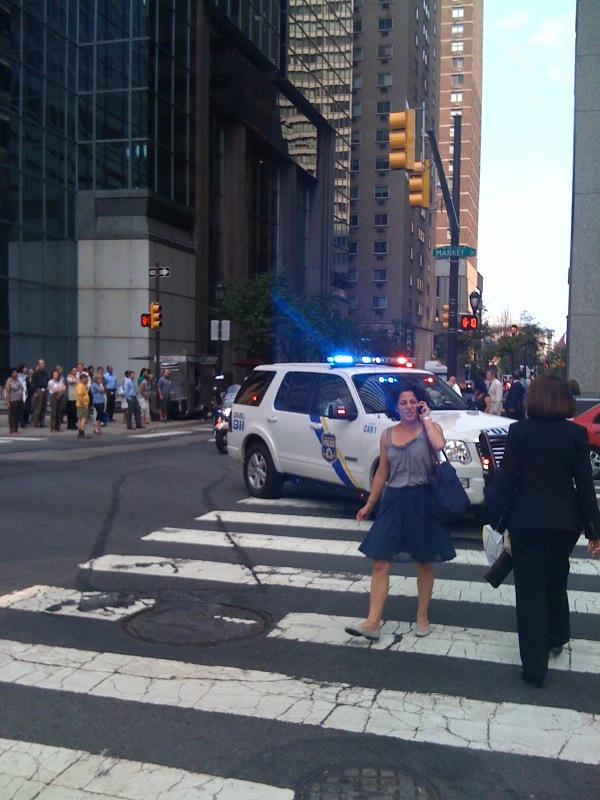 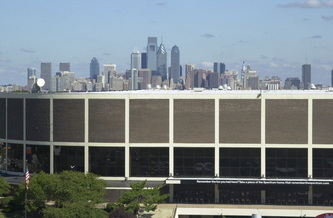 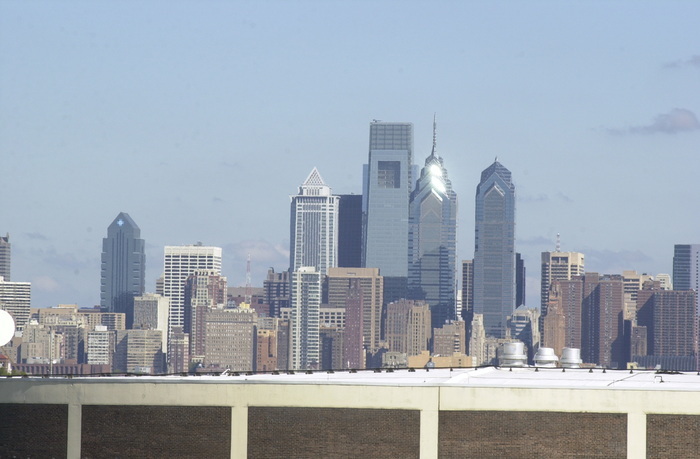 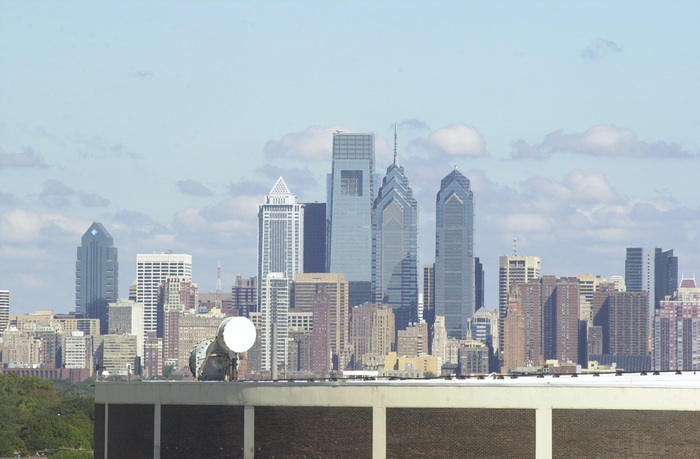 Tickets are also available at 30th Street Station on Wednesdays, September 8 and September 15 from 6 a.m. - 9 a.m. 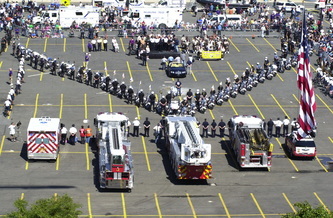 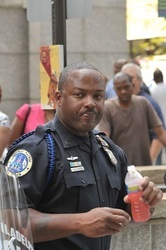 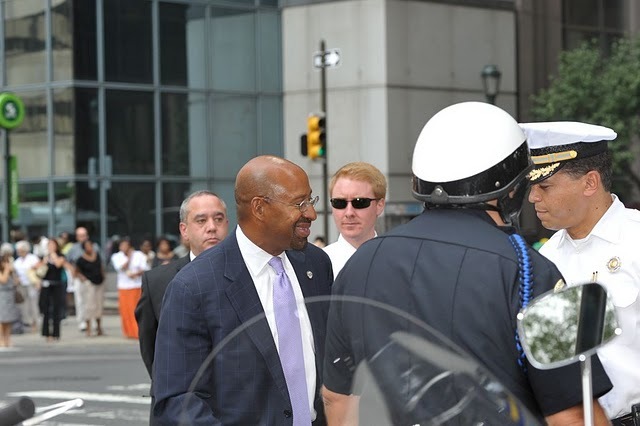 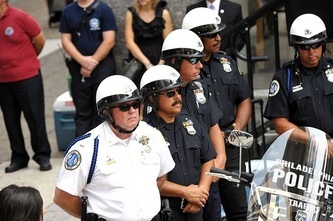 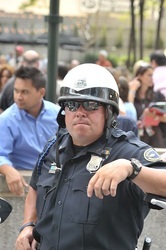 Proceeds, as stated before, will help children of fallen police and firefighters receive college educations. 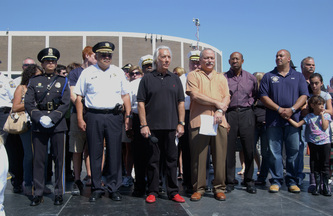 Visitors can applaud 6 scholarships as they are given to children of Chuck Cassidy, Steve Liczbinski, John Maryanowitz and Bob Stackwitz. 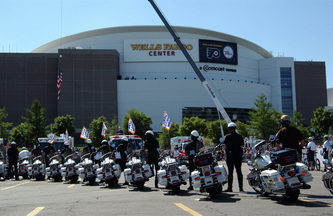 Fundraising actually started in April with the Battle of the Badges challenge. 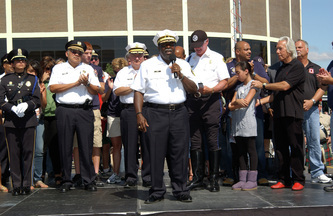 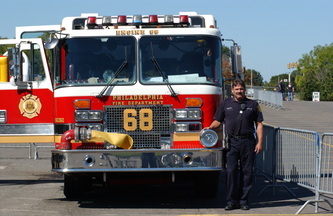 Weightwatchers will donate $10,000 in the name of the weight loss challenge winners, either the Philadelphia Police or Fire Department. 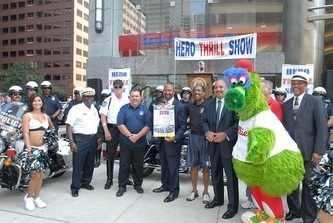 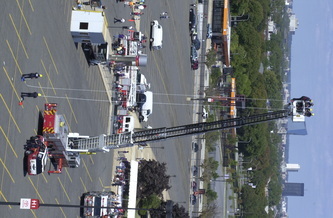 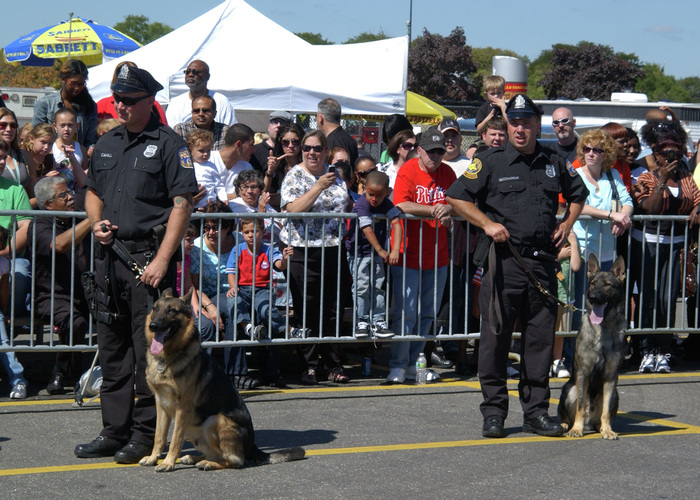 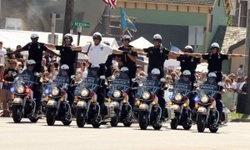 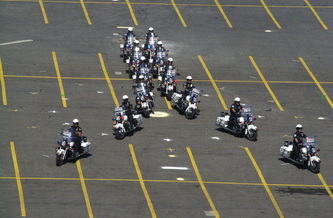 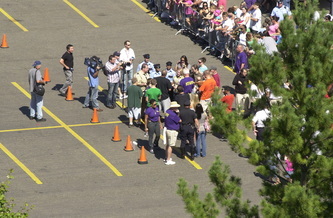 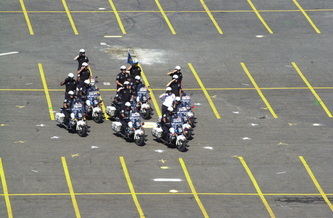 Both departments have until the week prior to Hero Thrill Show to drop the most pounds. 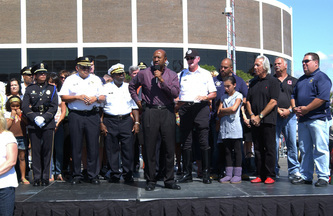 Boxing great Bernard Hopkins already donated $5,000. 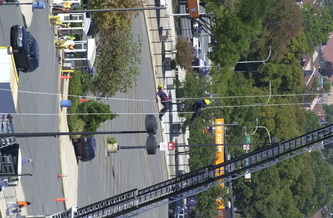 Binns would like tickets sales to generate another $500,000 for the cause. 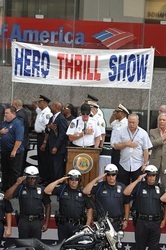 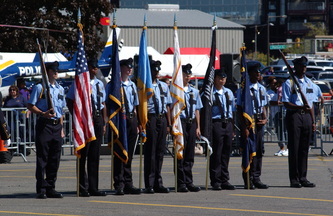 Hero Thrill Show Inc., a 501c(3) trust is not to be confused with the old Hero Scholarship Fund. 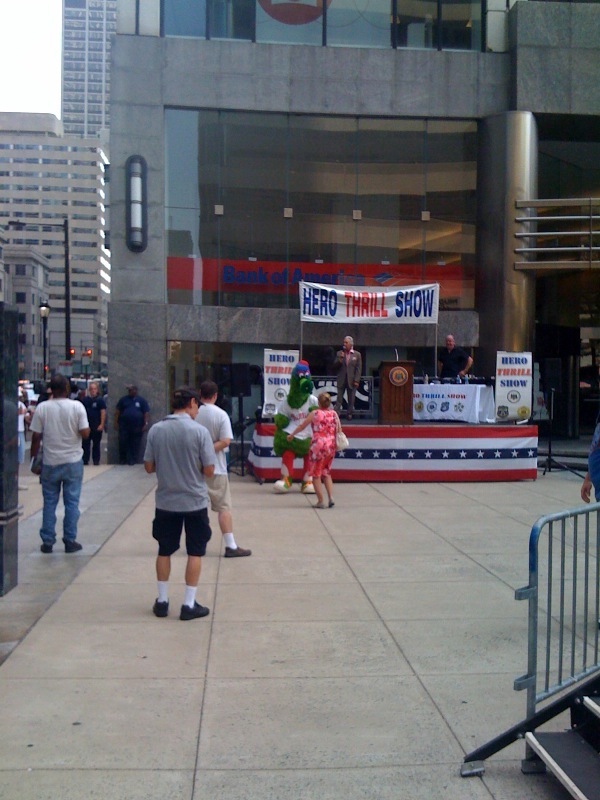 For more info: visit www.herothrillshow.org. 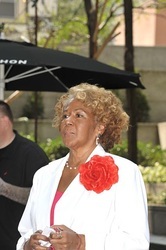 All rights to this article are reserved by Gloria Blakely. Copyright 2010. 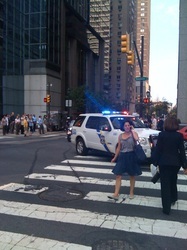 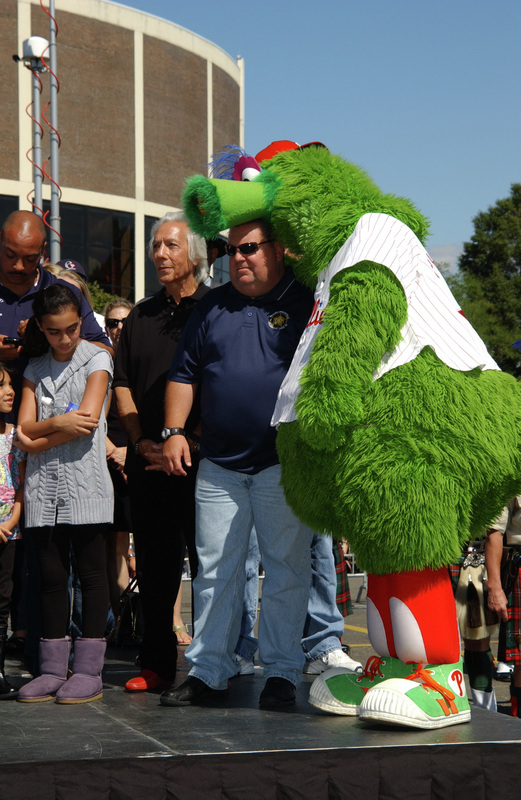 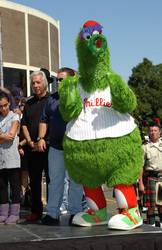 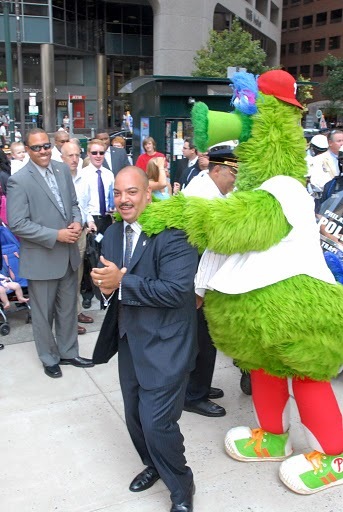 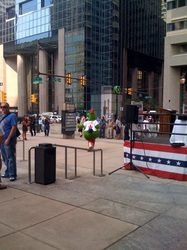 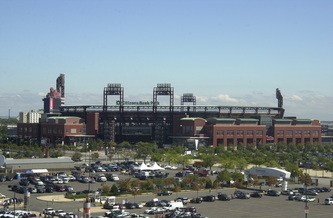 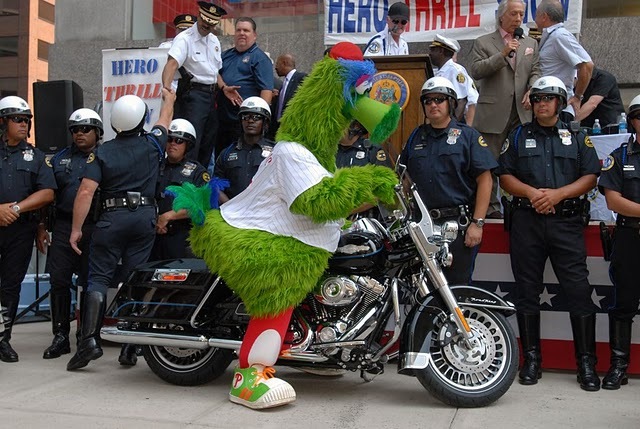 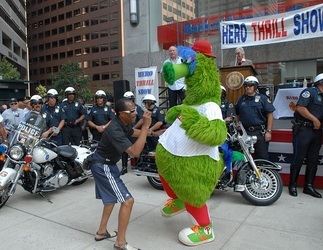 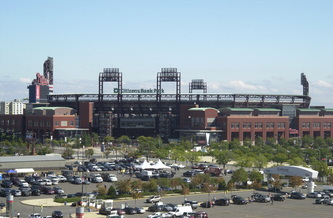 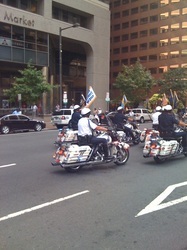 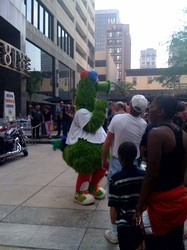 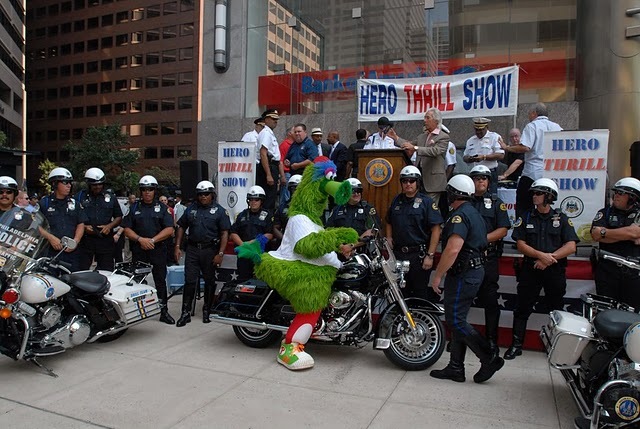 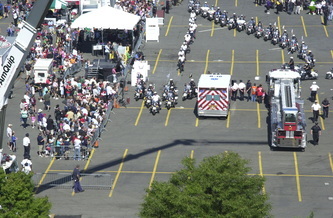 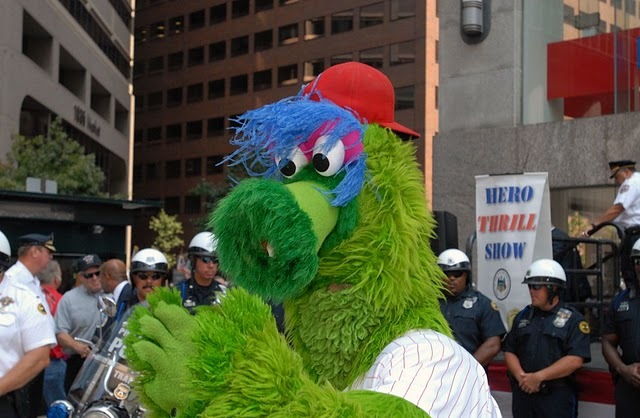 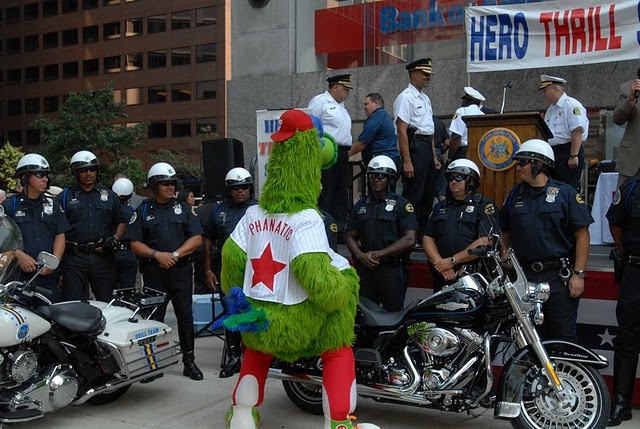 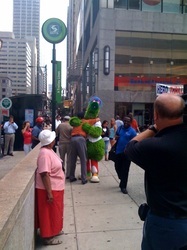 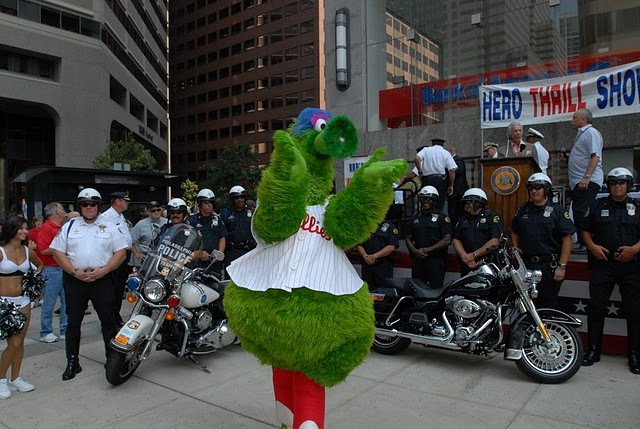 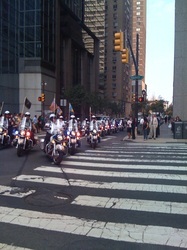 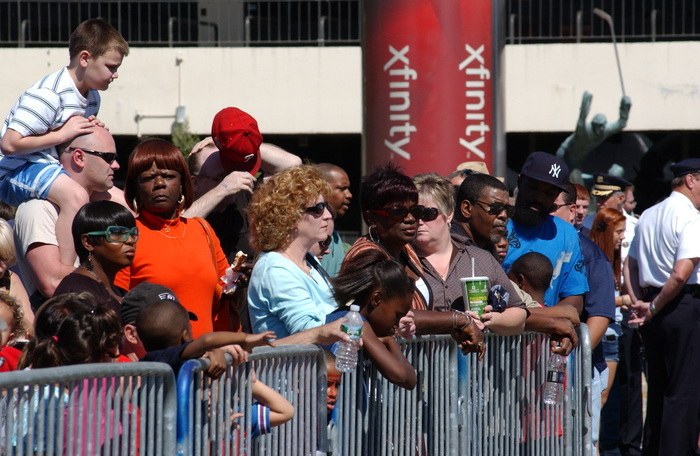 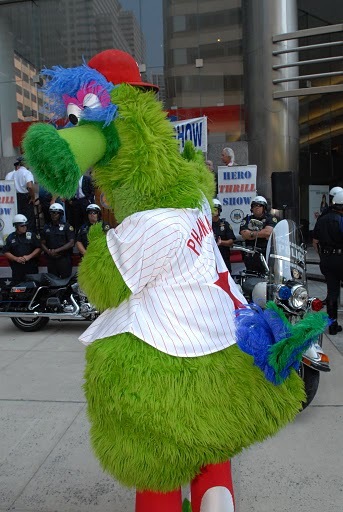 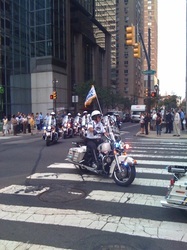 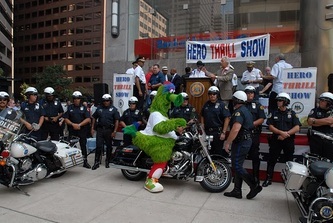 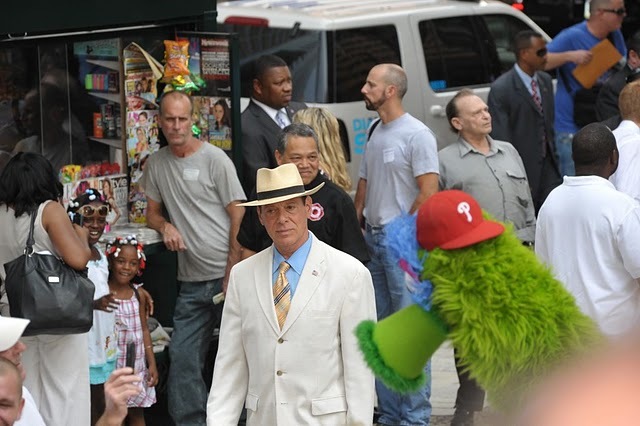 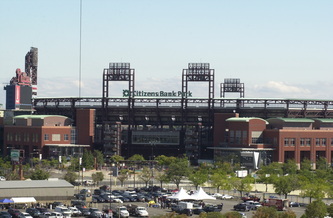 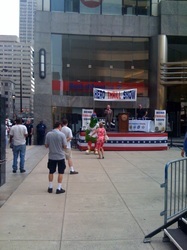 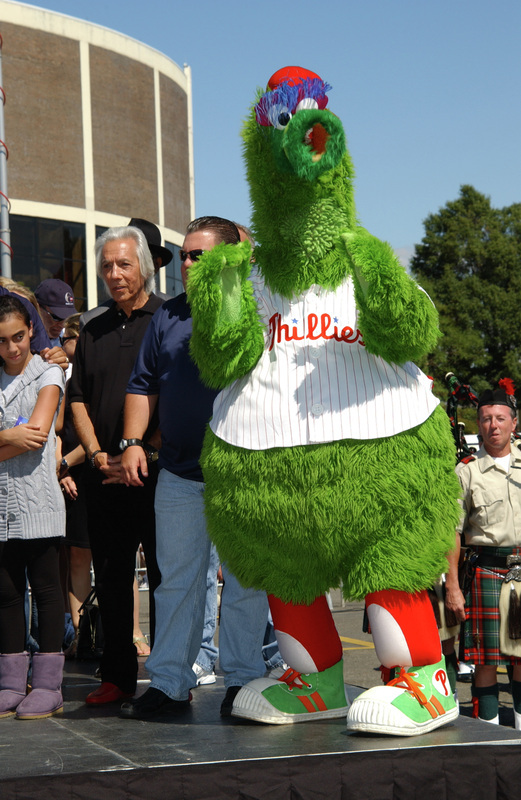 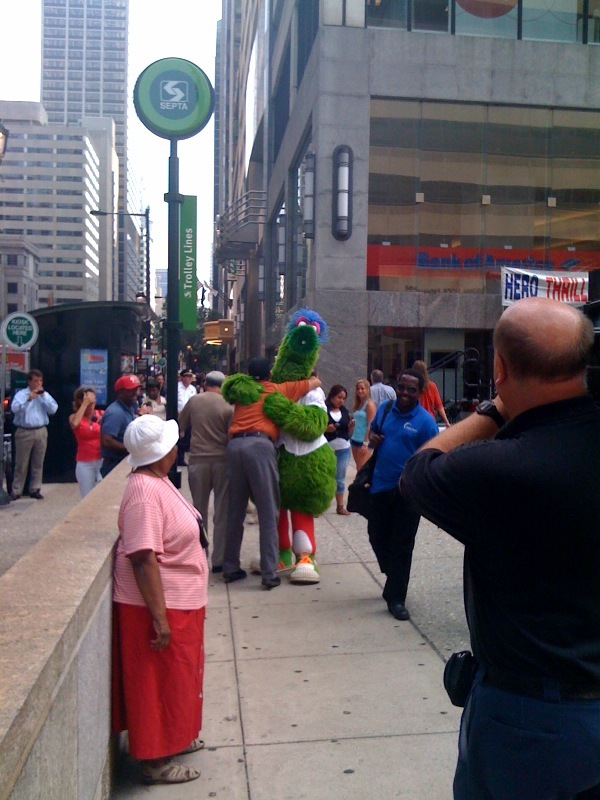 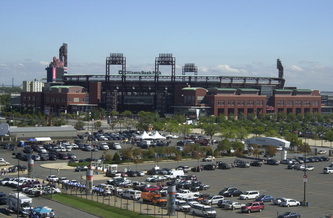 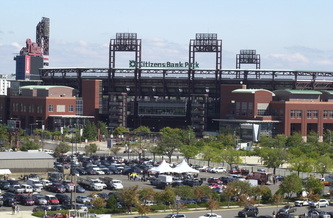 Well over 50,000 fans came out to show support..
fallen police and fire heroes and the antics of the Phillie Phanatic. 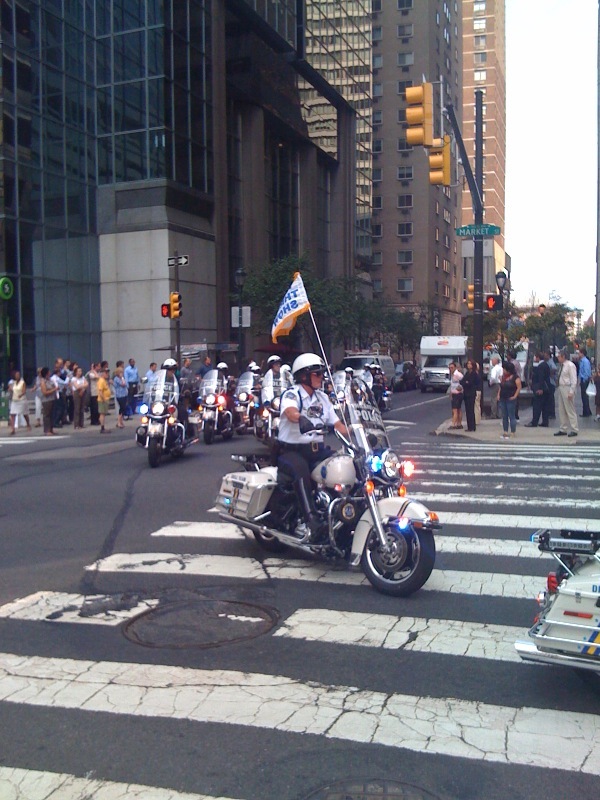 Main photo opportunity: Procession grand entrance arrival: South on 19th and east (making a left) onto Market St.
WHO: Scheduled: Mayor Michael Nutter, Hero Thrill Show organizer and attorney, James “Jimmy” Binns, Philadelphia police and fire patron and humanitarian; Police Commissioner; Police Commissioner Charles H. Ramsey, Fire Commissioner Lloyd Ayers; John McNesby, President, Lodge 5/Fraternal Order of Police; Bill Gault, President of Local 22/ Firefighters Union; 2009 Thrill Show; WOGL Radio personality Bob Pantano; Youth organizer and radio host Sonny Hill; Ring announcer Nino Del Buono; Philadelphia Police Patrol Motorcycle Drill Team; Fraternal Order of Police; patrons of the city’s police and fire departments.